WATERSHED is a reality at last. To order my second book of poems, please go to https://foldedword.bigcartel.com/product/watershed . I would write more, but I am in Alaska, and it’s difficult to write on my phone! I’ve just returned from our annual family hunting camp. 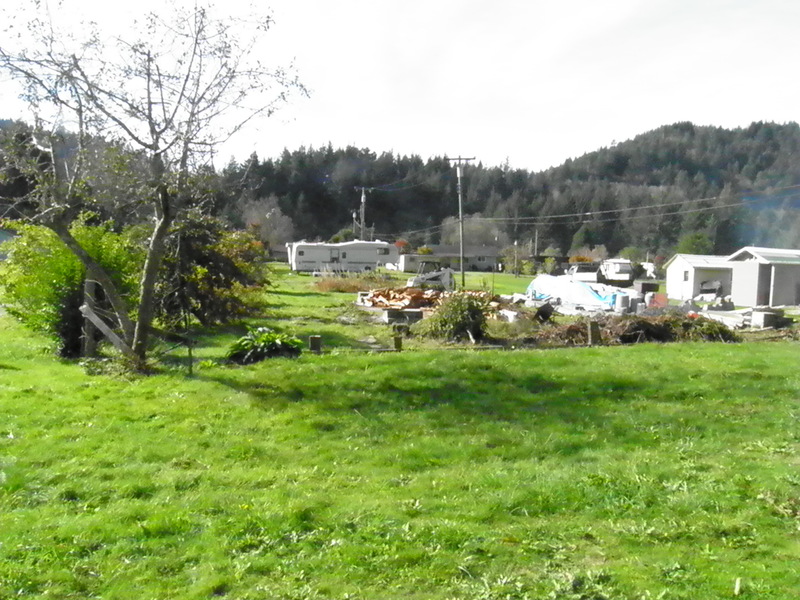 We pull the travel trailers into the same space every year, close to a spring with a pipe where we can fill water jugs and barrels to refill the water tanks in the trailers, so it isn’t truly dry camping. At this time of year, we usually can’t have a real fire, so some years ago, Dennis bought a propane campfire ring that we put inside the stone fire ring and pretend that we have a real fire without the danger of setting the forest alight. Every morning before daylight, the hunters make coffee in my son’s trailer and eat some instant oatmeal, yogurt, cold cereal, or cereal bars before they head out into the woods to hunt from blinds on migration trails or from tree stands. 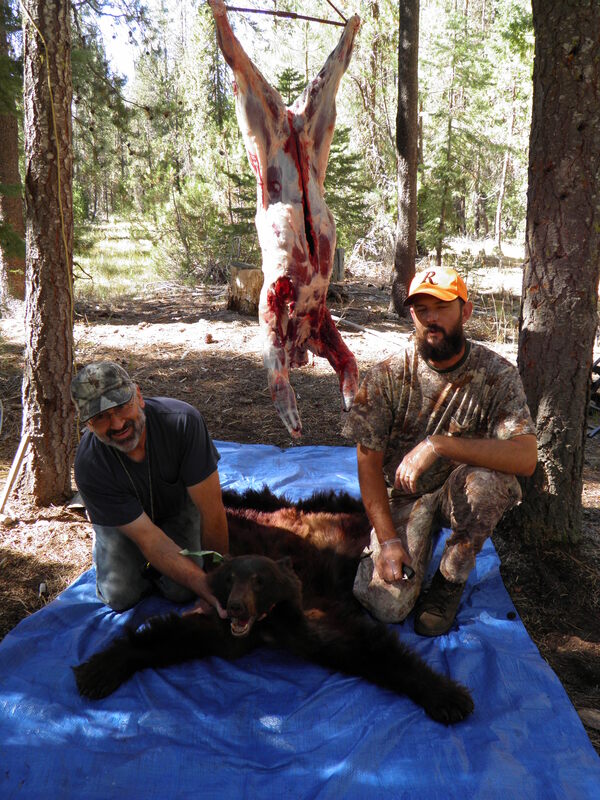 This year, my son filled his bear tag. As you know if you follow my Garden, Forest, Field blog, I am a big fan of bear meat and love cooking it. Joel said, “Mom, you’re gonna have to give me some coaching.” Of course, I will! Joel and Dennis trimmed 3 gallon bags full of fat off this bear, which I froze and will render a bit later, to use in pastries and for cooking and frying. 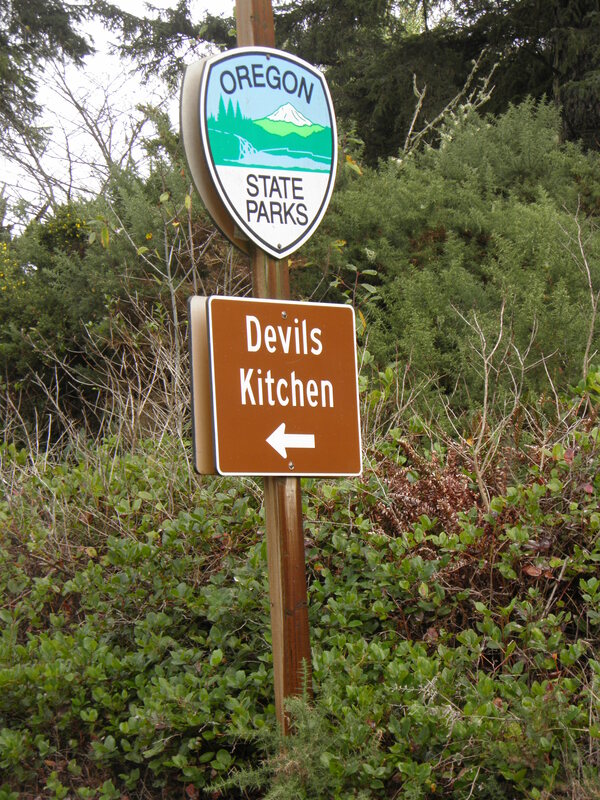 Those who aren’t hunting can sleep later and eat home-baked goodies like blueberry muffins, scones, coffee cakes, etc. with their coffee or tea (me). 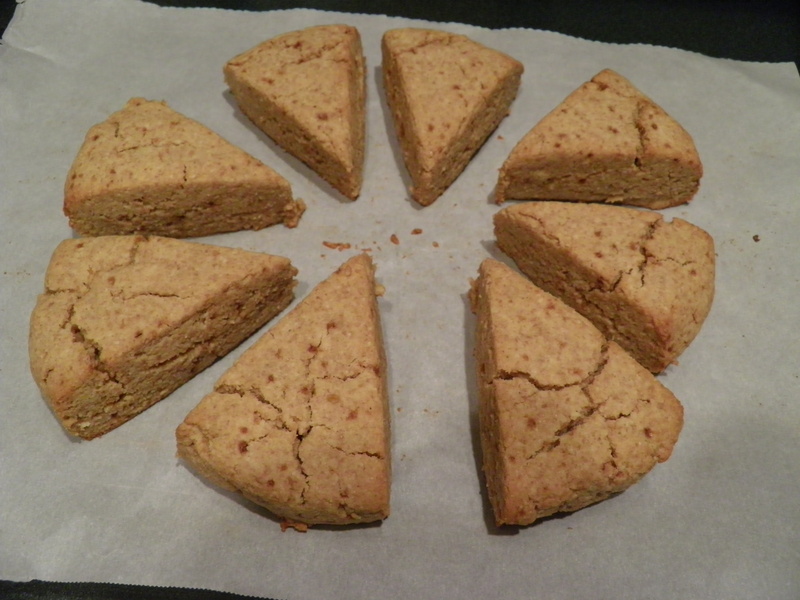 I made a bunch of gluten-free goodies—recipes for gluten-free, apple-cinnamon coffee cake and gluten-free, flaxseed scones coming to www.gardenforestfield.com soon! When the hunters return around 11 a.m., we often make a big breakfast together, with scrambled eggs, (bear) sausage or bacon, country potatoes or pancakes. (And this year, one breakfast included fried bear liver and bear heart from Joel’s bear.) 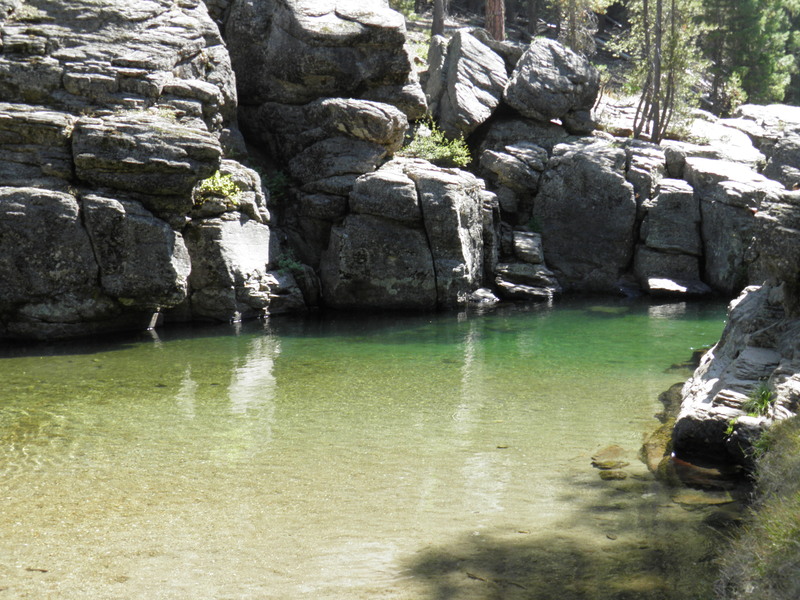 Then, it’s off to the swimming hole at the river or a visit to one of the many nearby lakes for an afternoon jaunt. 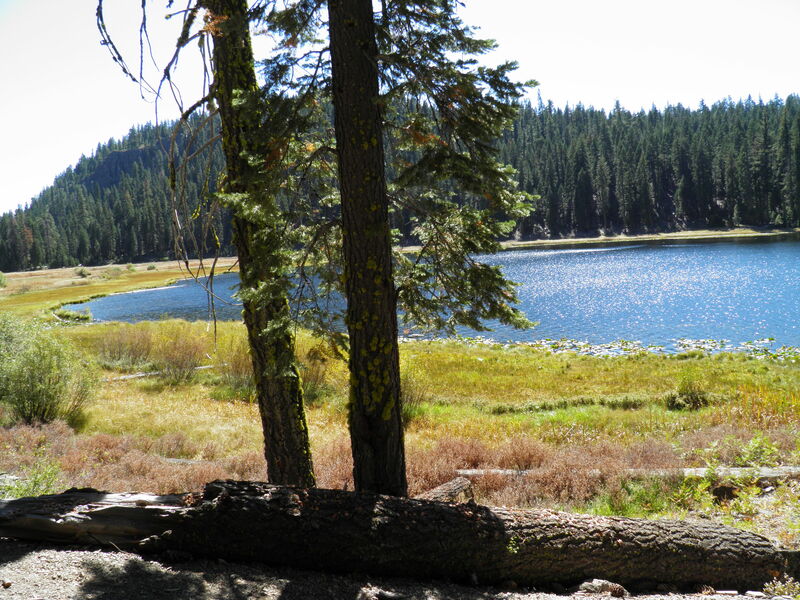 This year, one excursion was to Willow Lake. This lake is unique for our area, but much has changed since I first visited it more than 20 years ago. At that time, I was with a group of college students. 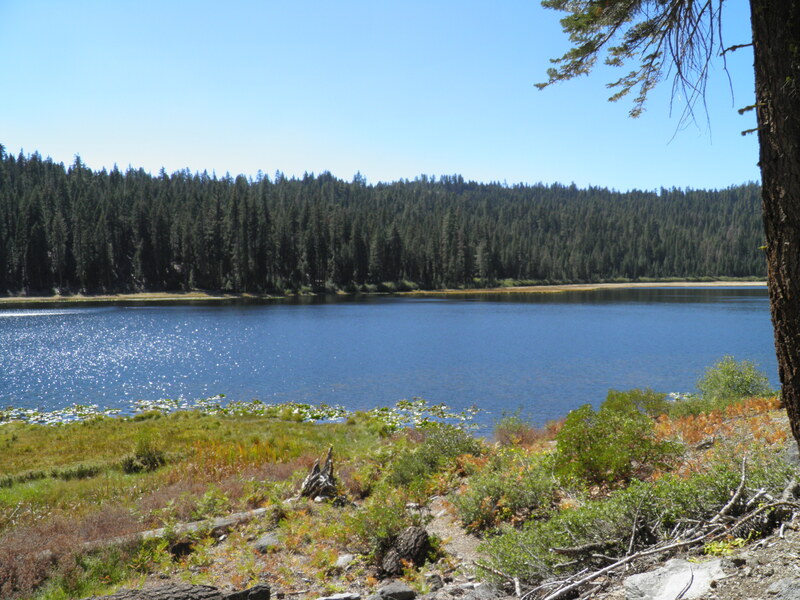 I was taking a natural history course at Lassen College at the time, and our instructor, Jim McMillan, brought us up to Willow Lake to look for birds and walk on what makes, or made, Willow Lake unique: the sphagnum bog. I remember at the time, Jim told us that the bog was turning to marsh, and the marsh would eventually turn to meadow. I never thought I’d see it happen in my lifetime, but in our visit there a few days ago, it was clear that much, if not most, of the bog was gone because of the severe drought in California. 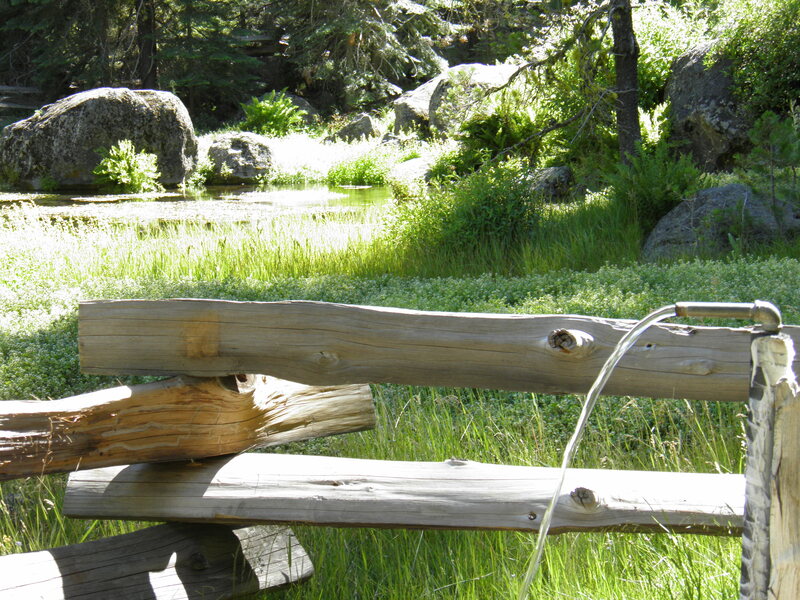 Here is a link to pictures of the lake taken in 2007, before this current drought started: http://creagrus.home.montereybay.com/CA-PLU-WillowLake.html. Our area in Northeastern California has been through several severe droughts since we moved here in 1996, and the bog has persisted, but this is probably the worst drought of all, and I don’t know if the bog can survive another dry winter. I fear not. It made me sad to see the change, but the lake itself is still beautiful, and I remind myself that nature is constantly changing and evolving. 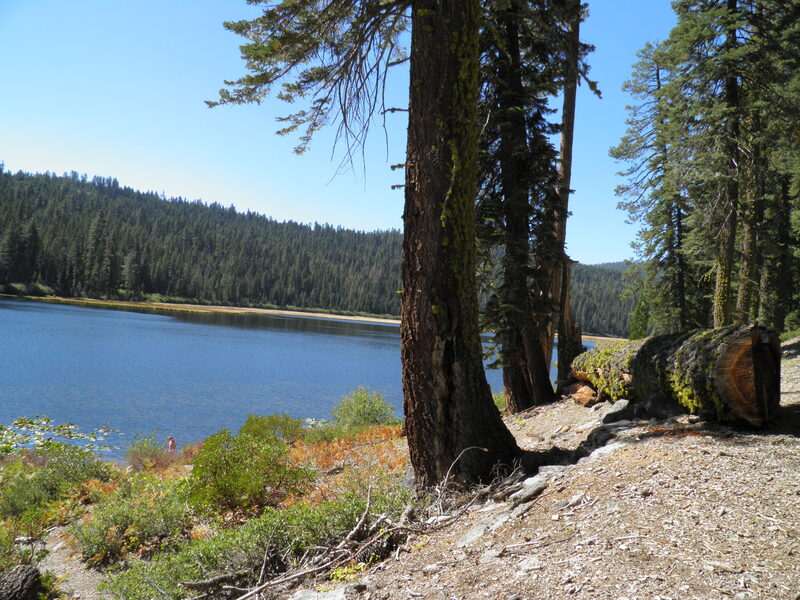 Here are my pictures of the lake from the trail above. The swimming hole on the river was lower than it was in July, naturally, and the water was so cold, I waded for a few minutes, hoping my feet would get used it. I climbed out after five minutes, completely numb, and it took another five minutes, at least, for feeling to return to my toes! After we swim or wander, it’s back to camp for something to eat for the hunters before they go out for the evening hunt. For the non-hunters, it’s cocktail hour. I brought some of my favorites this year: bear liver pate (from Dennis’s bear in archery season), and charred salsa. We also had various cheeses, chips, crackers, and wine and beer (because it’s cocktail hour, of course). A snack is necessary because we don’t eat dinner until the hunters return after dark, about 8 o’clock in the evening. This year, I made an executive decision to do dinners differently. Last year, I ended up being camp cook, cooking up the raw ingredients everybody brought. I was kept hopping between the outside propane grills and the stove top in the trailer. I was exhausted after camp was over, and I decided that I wanted to enjoy the dinner hour more with my family. So this year, I asked everyone to bring a make-ahead meal that could just be reheated quickly and easily. I took two nights, and I got to make a couple of my favorite dishes: Bear Sausage and Eggplant Lasagna, and spaghetti with bear sausage in Italian Red Sauce (the sauce was in the freezer, and I used it in both dishes). I froze both the lasagna and the spaghetti sauce, so all I had to do was heat the lasagna in the oven, the spaghetti sauce on the stove top, cook the spaghetti noodles, throw a salad together, heat up some previously cooked green beans with bacon and onion that I’d also frozen, and heat up some store-bought garlic bread. That was dinner on arrival night, and we had leftovers to munch on through the rest of the weekend. The other meal I prepared ahead was Pulled Pork. This is such an easy crock pot recipe, and I was able to cook it ahead, skim the fat off the drippings so I could make my own sauce, and freeze it all in gallon bags. I took the pork and sauce out to thaw the morning of my dinner obligation, and when it was thawed, I put it all in a 9X13 baking pan, poured the sauce over it and mixed it up, covered the pan with foil, and heated it in a low oven (250 degrees) until it was hot. The French rolls (from Grocery Outlet) were hanging out in the freezer to keep them fresh, so they were also thawed. To go along with the pulled pork sandwiches, I bought bagged, shredded coleslaw mix and made up a big jar of my famous (in the family) coleslaw dressing. My son says he hated coleslaw until I started making this dressing. All I had to do the night of serving was chop some onion, which my sister did for me, and mix the shredded cabbage and carrots with the onion and previously-made dressing. That night, we also had a big pan of the Pioneer Woman’s cheesecake squares with blackberry topping. I’d made the cheesecake ahead and frozen it, and the topping was hanging out in the trailer fridge for a few days. That cheesecake was a big hit, even though the top was badly cracked (despite the pan of hot water in the oven). Other families brought other things: my sister, Goldie, and niece, Brielle, brought homemade chili and macaroni salad (my sister’s specialty, and oh, it is so good! ); my son, Joel, and his wife, Tori, brought smoked and barbecued ribs (Joel did a great job with them), mashed potatoes, and corn on the cob, and my sister-in-law, Cheryl, and my other niece, Corrine, brought the fixings for steak fajitas and seven-layer-dip. Brielle also brought homemade cookies, and Goldie brought homemade pumpkin and banana-nut-bread, and Cheryl and Corrine brought apple cake, chocolate zucchini cake, and zucchini bread made with my mom’s old recipe, which adds pineapple to the mix. Cheryl gave us all a copy of the recipe, which made me very happy. After dinner, we sat around the propane fire ring and sang along with Joel on the guitar, or we told stories about our parents and people we’d known growing up. We had such a good time every night, nobody really wanted to go to bed. Family and great food and the beautiful mountains. It doesn’t get any better than that. We all look forward every year to family hunting camp. 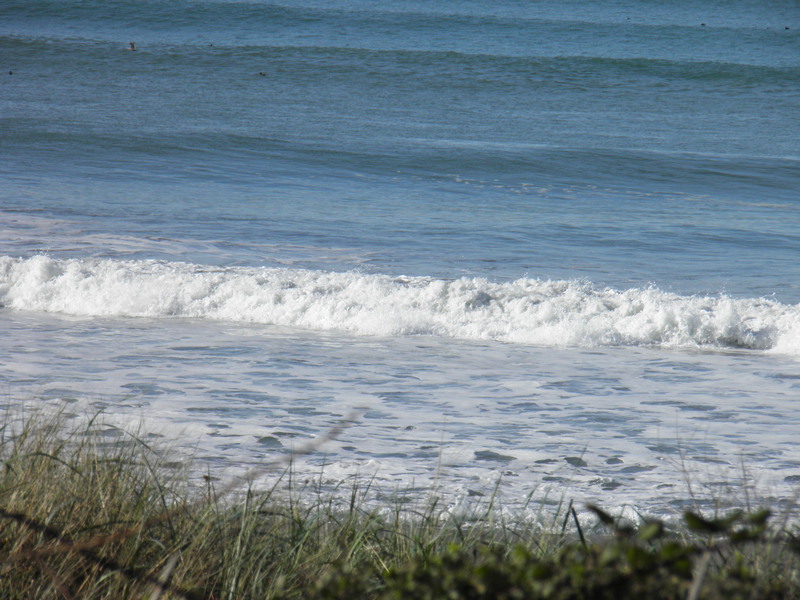 On Sunday, after we went into town for a wi-fi connection and a couple of errands (and coffee for Dennis and ice cream for both of us at Cowlicks), we drove north along Highway 1 towards Westport and Rockport, looking for a beach where we could picnic. Because of road construction and other people looking for same, we drove nearly all the way to Rockport before turning around and coming back to our camp at Cleone. 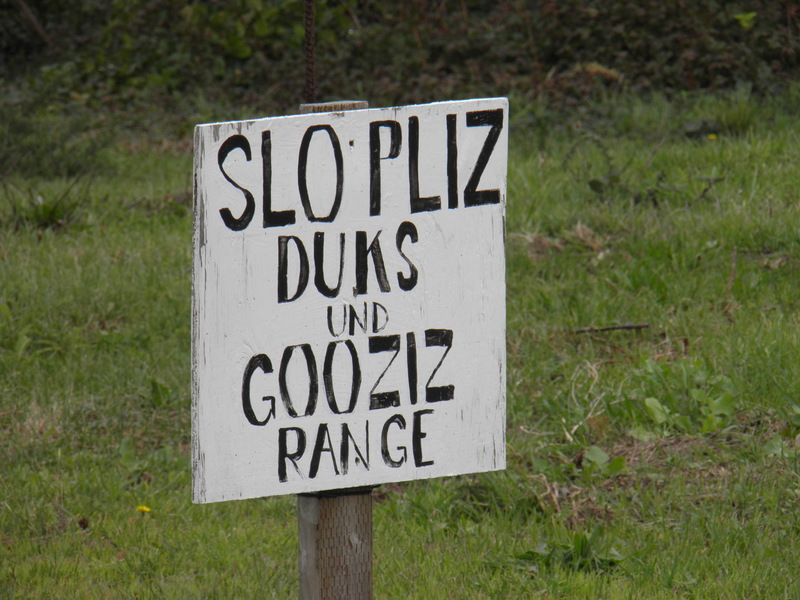 But on the way back south, along this drive that is so familiar, we saw something I’ve never seen before. 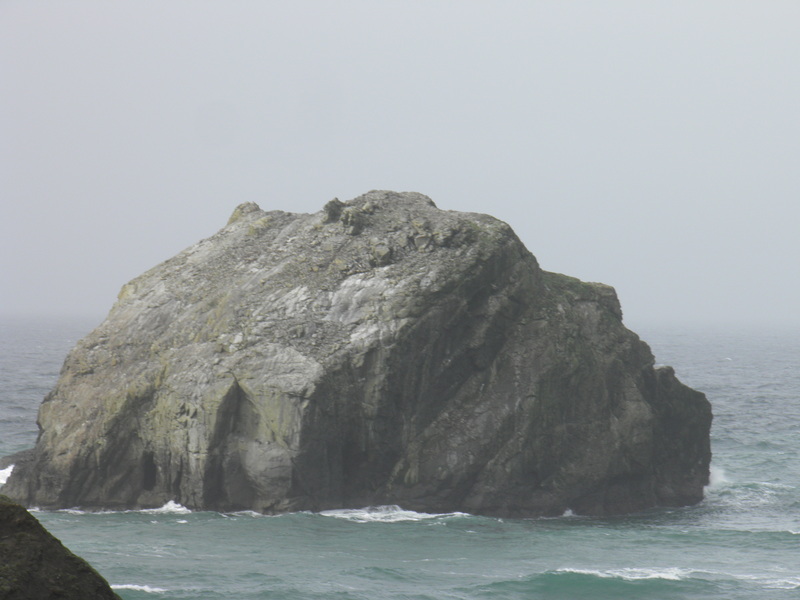 I’m sure this rock is named on a map somewhere, but I don’t have one, so I’ll just call it Arch Rock. That could even be its name. Probably the reason I’ve never seen it before is that you can only see it from the southbound lane on Highway 1, and if you’re not looking out at the ocean at just the right spot, you will miss it. 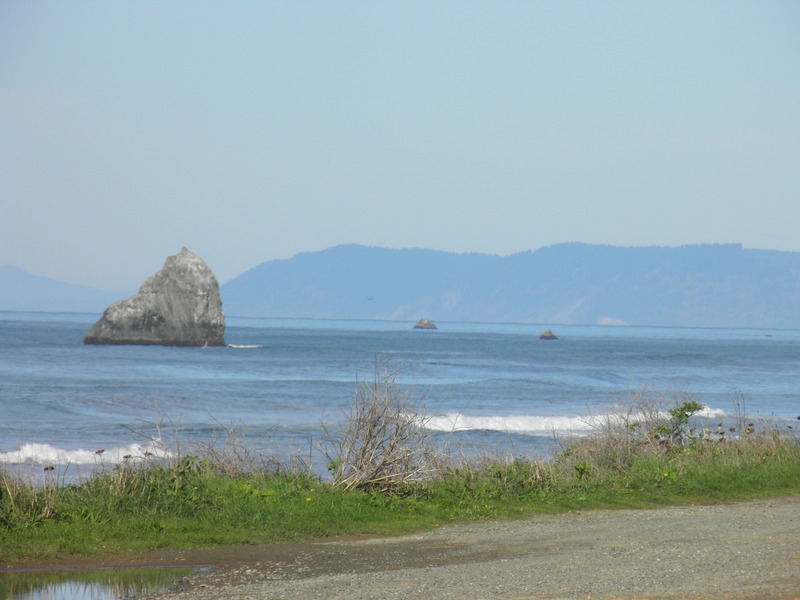 Considering the fact that over the many years we drove this way from Klamath to Fort Bragg we were nearly always on this coastline stretch in the dark, it’s not that surprising that I missed Arch Rock before. But on this day, there it was, and there’s a convenient spot to pull off the road, just large enough for a couple of cars or trucks, so we did. 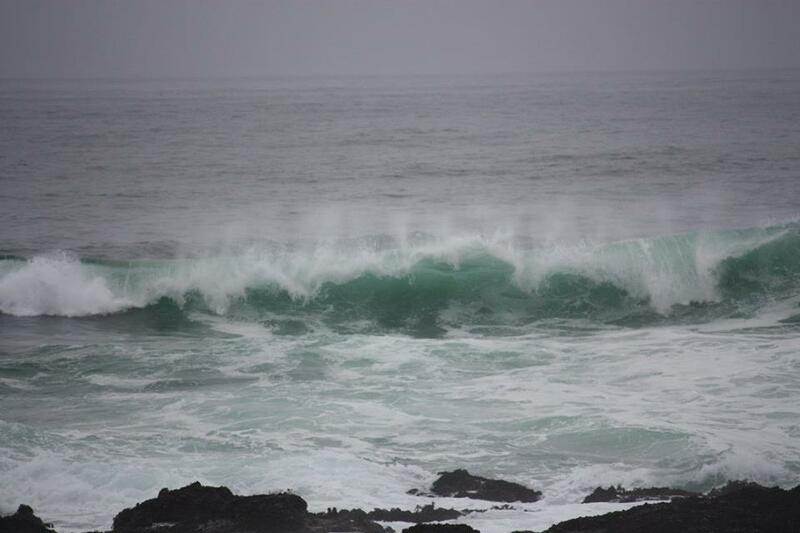 Here are the pictures I took of this magnificent seascape feature. Wouldn’t it be cool to go through the arch in a boat? Probably very dangerous, but still cool! 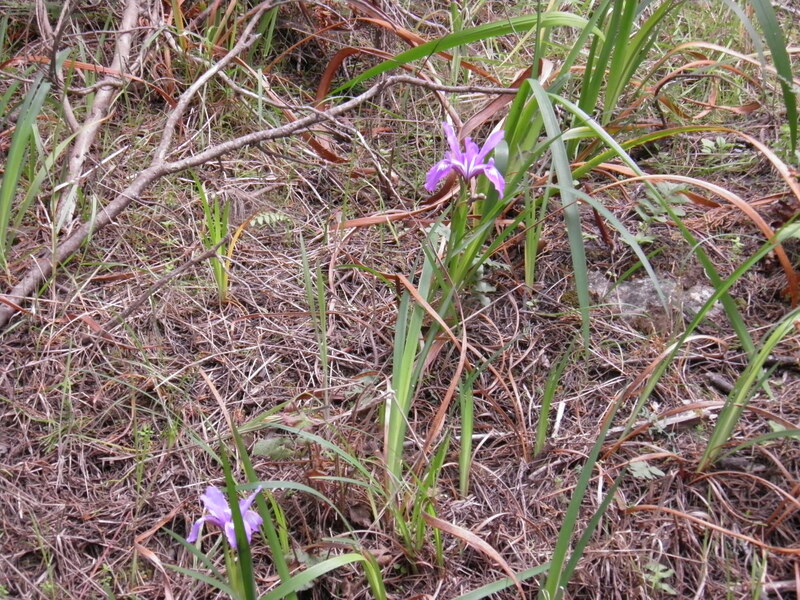 On the way back to camp, I took these pictures of wild irises out the truck window while stopped for road construction. We ended up eating a late lunch in camp and then went down to the Tenmile Beach access, which is just a mile or so from camp. I wandered over to the rocks to sit and contemplate the surf (it was very rough the whole time we were there—more about that later). I took a video which I can’t post on the blog but will post to the Facebook page. My camera doesn’t take great videos, but I can’t resist trying to capture the sound of the surf so that I can revisit it whenever that longing takes me. Having grown up with the sound of the sea as an undertone in my daily life, like a great mother heartbeat inside the womb of the world, I miss it in a bone-deep, fundamental way. Just as a baby is soothed by the sound of her mother’s heartbeat, both in the womb and after birth, so I am soothed and relaxed by the sound of the ocean. On our way back up the beach to the truck, Dennis remarked, “It sure stinks down here!” I said I hadn’t smelled anything over there alone in the rocks, but I could smell it as we walked up through the tunnel and into the parking lot. “It smells like something dead,” he said. Just as we reached the parking lot, a truck towing a flatbed trailer drove along the bike/walking path and through the access gate. It was loaded with what looked like wet wood, at first, until we got closer. Then we could see (and smell) that the trailer was carrying the dismembered carcass of a sea mammal. I thought it was a whale at first, but it seemed too small. I walked around, taking pictures and video and holding my breath as much as possible, and talked to the man driving the truck. He told me that the carcass was that of a killer whale who had become tangled in some crab pot rigging and had presumably drowned, then washed up on the beach about 300 yards south of where we were. It’s possible that it died from some other cause and became tangled in the rigging after it died, so biologists would take samples and test them to find out the cause of death. This was a 26-foot orca, a young male. 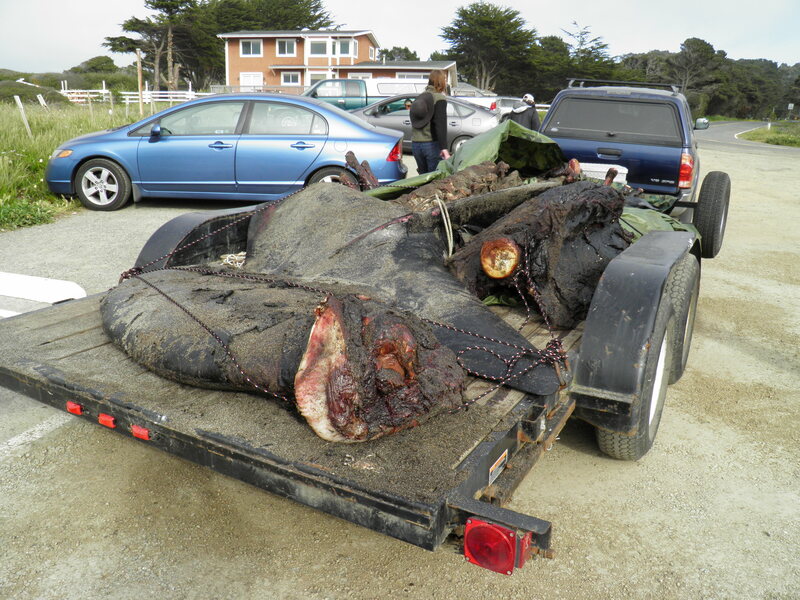 I asked what they were going to do with it after sampling and testing, and the man said they were going to clean the flesh off the carcass and rearticulate the bones for display at the interpretive center at the new Noyo Headlands Park on the old mill site at Glass Beach. He said they also have a blue whale skeleton which will be displayed there. I was wishing I could have seen the killer whale before it was dis-articulated, but oh my, what a stench! Still, it was fascinating to see the joints and vertebrae. I have a video of it that I’ll post on the Facebook page. After that, we headed back to the beach at MacKerricher State Park, just a mile or so away and on the south side of Cleone. This is my favorite beach in Fort Bragg (besides Glass Beach) because of the way the waves come in on the beach and polish the little beach pebbles to a high gloss, almost as if they’d come from a rock tumbler. The wave action there pounds the rocks into small pieces and then polishes them with the sand the waves have already made. This beach has the most beautifully-colored and glittering, polished sand of any beach I’ve ever seen. But you have to get down on your hands and knees and really look at it, and this is what I love to do, picking through the sand for pretty pebbles while the waves crash in the background. Dennis walked up around the boardwalk on the point for some pictures while I picked pebbles. I’m thinking jewelry-making again. Dennis took this picture of me from the point. I’m the little dark blob in the middle of the photo! 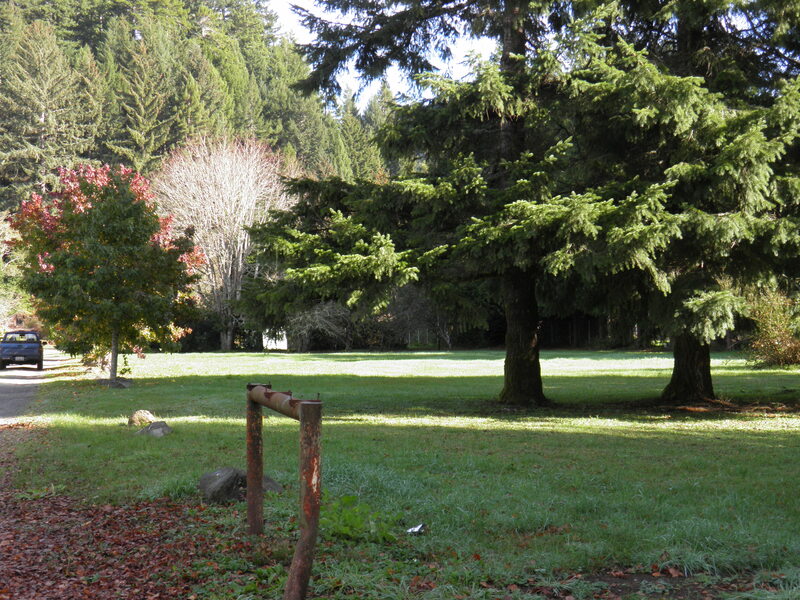 This is a panorama Dennis took at MacKerricher on Saturday. Dennis took the rest of these pictures on the point. He took a lot of wave pics. 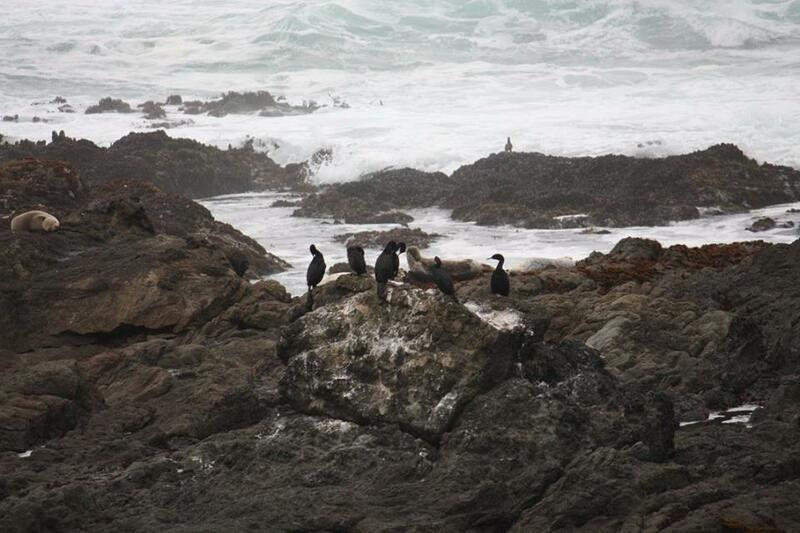 I chose my favorite, along with a picture of some cormorants and sea lions. And then it was time to head back to camp for dinner and to start packing up. 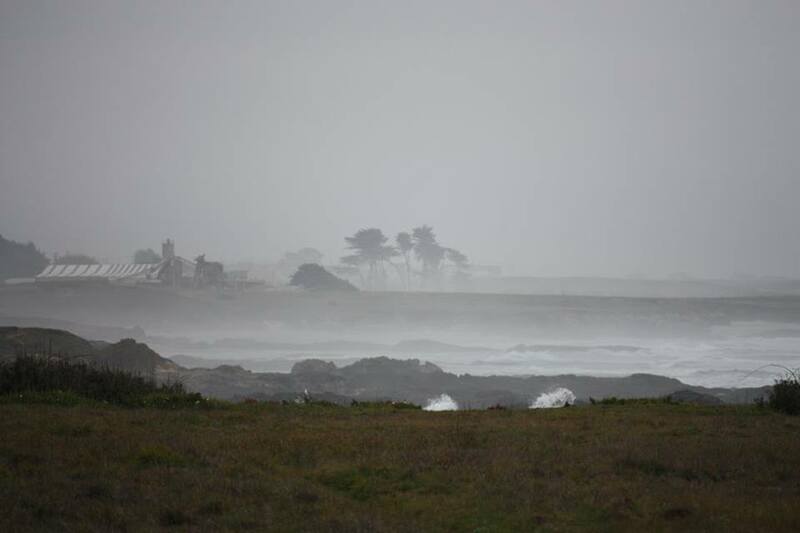 It’s always hard to leave Fort Bragg, but the weather cooperated by turning cooler and very foggy. It’s much more of a wrench to leave when the sun is shining on that ocean! 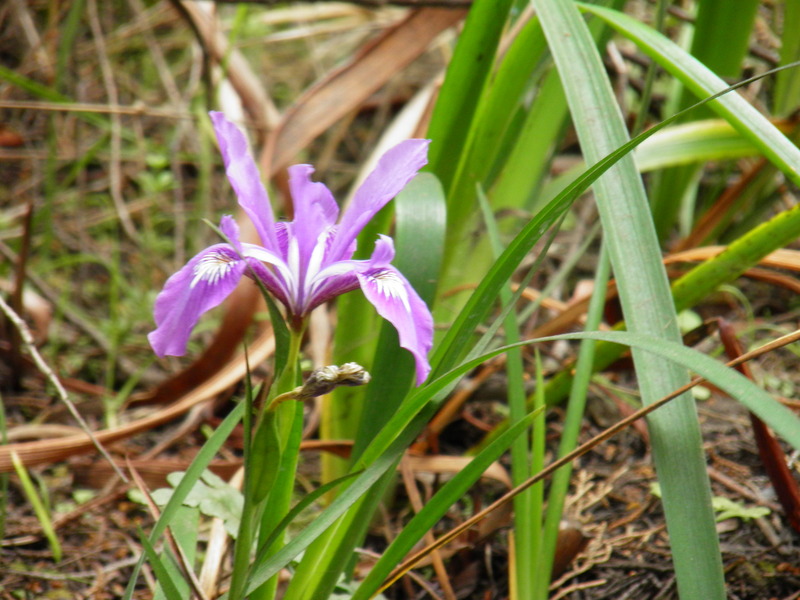 I have one more story to tell about our trip to Fort Bragg, and I leave the best for last and out of order because I don’t have any pictures for it. As I said earlier, the ocean was really rough while we were there, so rough Dennis couldn’t dive in the open ocean or even in any of the more protected coves for abalone. Indeed, we found out that just before we arrived, four divers had drowned in rough water—a tragedy that could and should have been averted with the application of some common sense. It was just too rough to dive. Dennis has dived in some rough spots in bad conditions in years past, but he’s developed more sense with age and maturity, or maybe just a finer sense of mortality. At any rate, he decided to dive in Noyo Harbor, which is one of the most protected spots where you can find abalone if you know where to look. It’s not a popular place to dive because it requires a rather long walk in an uncomfortably tight wet suit, packing a dive tube, weight belt, and other accoutrements, but when he’s come all that way to dive for ab, he’s willing to make the walk. Our friend, Louie, went with him that first morning on Saturday. Dennis had to push the baby sea lion away repeatedly. He really wanted to pick it up and hold it, because the man has a tough exterior but heart like a marshmallow when it comes to baby animals, but he didn’t want to do anything that would cause its real mother to reject it if she was still alive. Finally, the little thing swam away, still crying for mama, and he dove. He found an ab, popped it off, and surfaced some distance away from his tube. There was the baby sea lion, nosing his dive tube and bleating for mama. He shooed it away and stowed his ab. Further out toward the mouth of the harbor, he noticed an adult sea lion with a larger young one. They swam off, and the baby followed them, still crying for mama. And we have no pictures! Aaarrgh! Well, at least we have the story. We told the grandkids about it last night, and I have a feeling it’s a story they’ll tell their kids one day, about the time their grandpa was mistaken for a mama sea lion. Quite a few years ago, I wrote an essay that won first place in an essay contest. 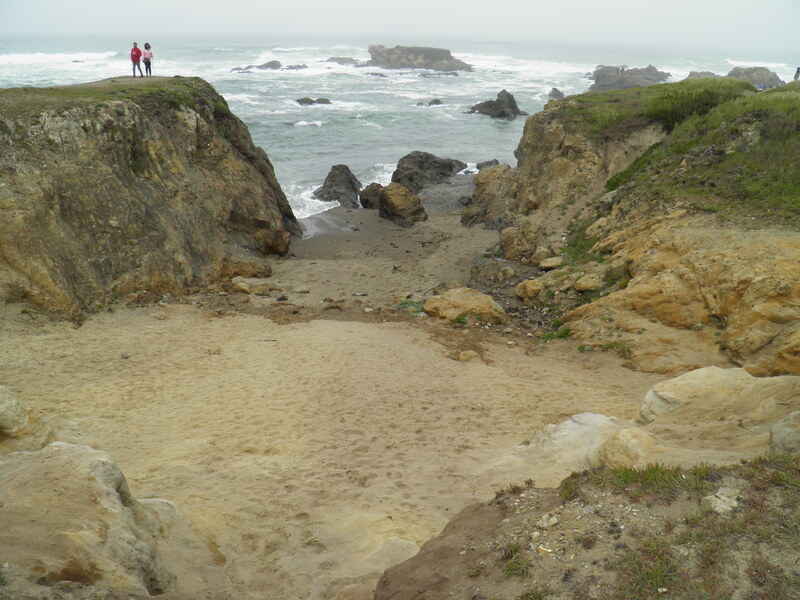 The essay was about a place I’ve visited for years, Glass Beach, in Fort Bragg, California. The essay appears below, accompanied by photographs from this weekend’s visit, and after the essay, a postscript. 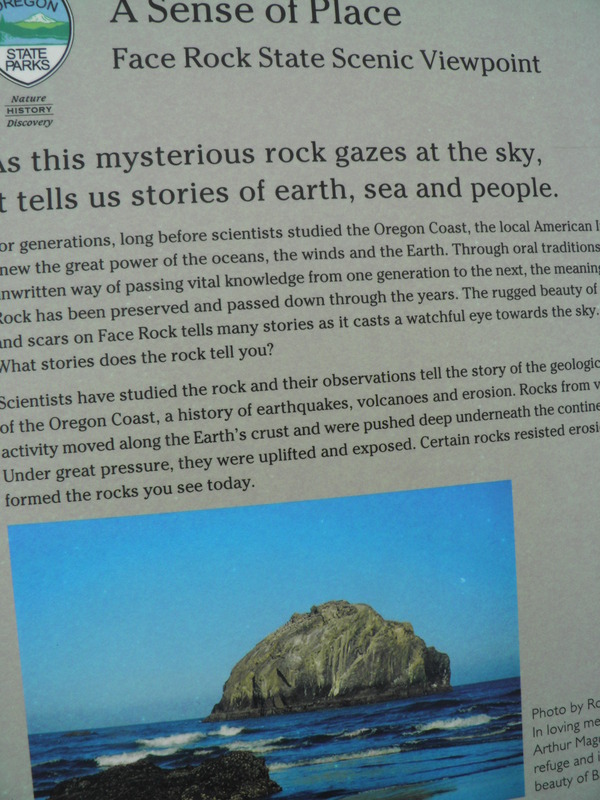 A lot has changed at Glass Beach since this essay was written, and yet some essential things are the same. On California’s northern coast, a string of small towns along Highway 1 weathers both the rough winters and the onslaught of summer tourists. 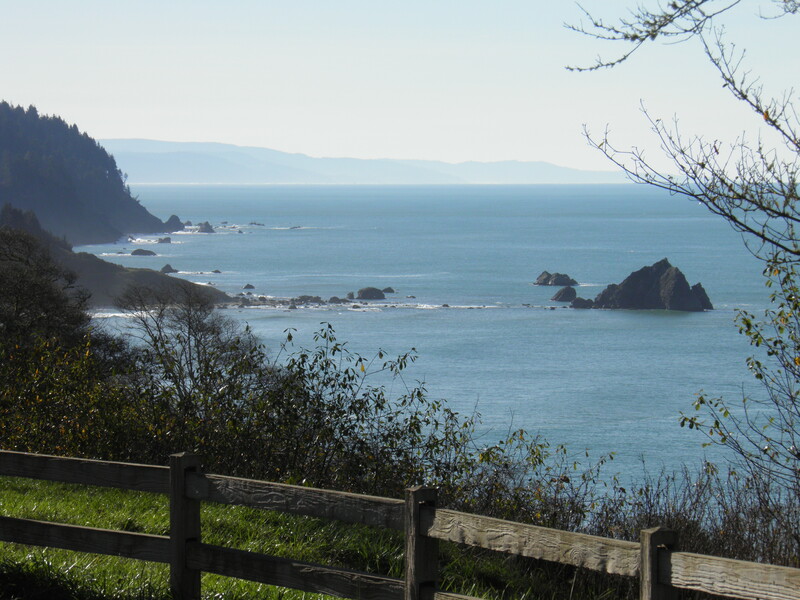 The area known as the Mendocino Coast has become a popular weekend playground for thousands of San Franciscans getting out of the city. From the first hint of spring until after school starts, the tiny coastal towns and their beaches are inundated with tourists, bringing with them money, cars, and garbage. But in one place at least, tourists take garbage home with them. This place is Glass Beach, in the town of Fort Bragg. 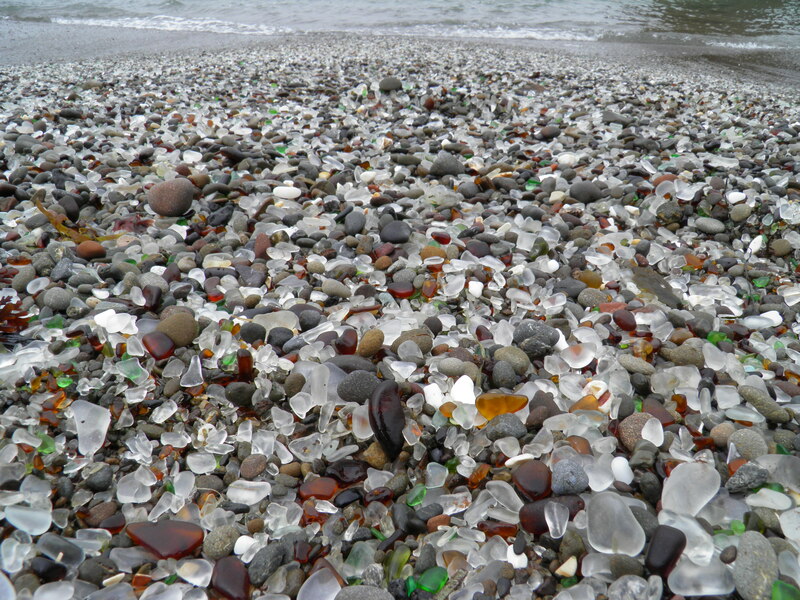 Glass Beach is the site of an old dump. 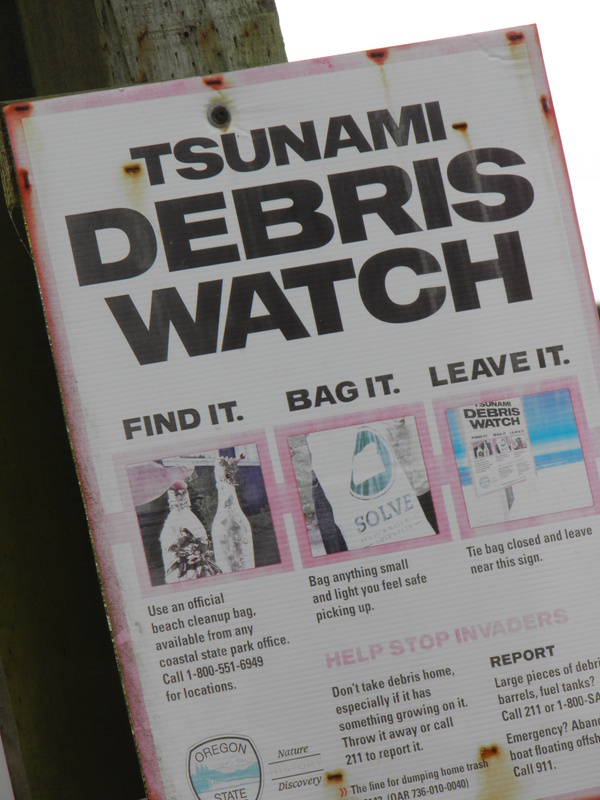 Until the late 1960s, household and industrial garbage was dumped right off the cliff onto the beach itself. Larger items were unloaded on the crumbly bluff a short distance from the shore. Then the refuse was burned, bladed over with dirt, shoved into the ocean, and the process performed over and over again for many years. 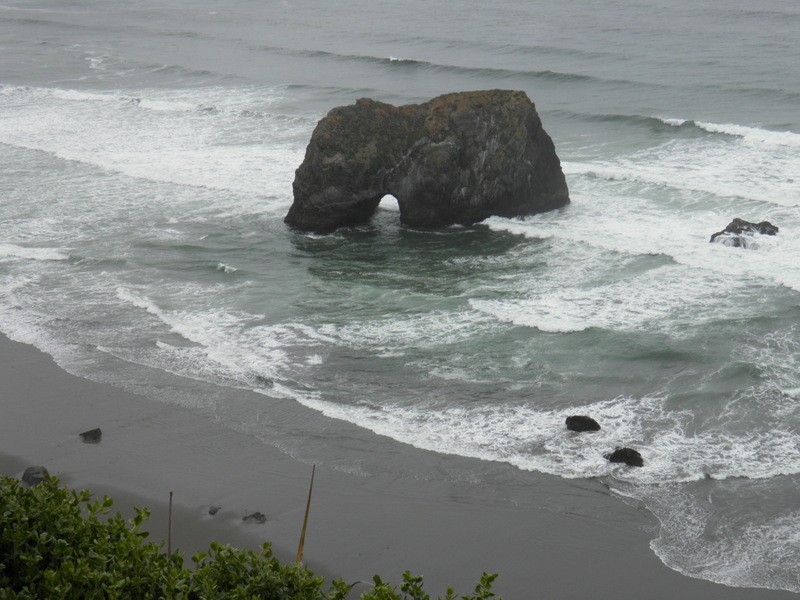 Such dumps were once common up and down the northern California coast. At Glass Beach, a concrete retaining wall was poured over some sections of cliff in an attempt to stop the incursion of the sea into the landfill. 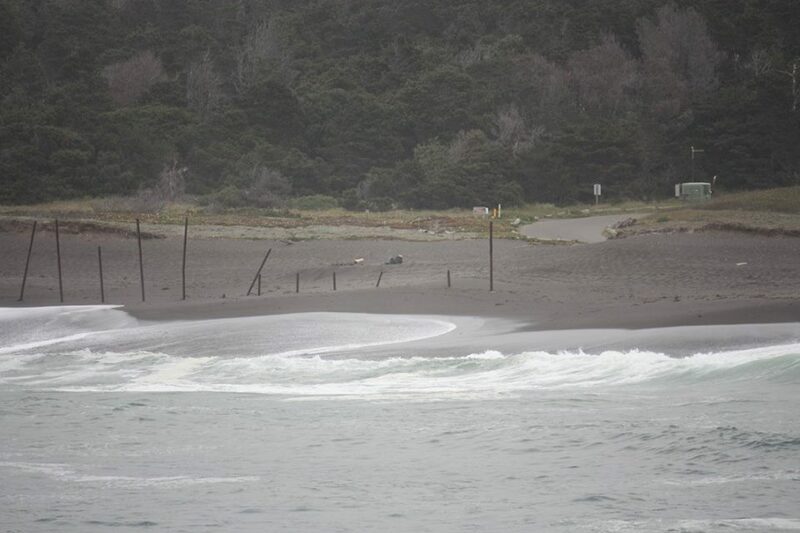 But nothing stops the sea, a lesson many landowners on the Mendocino coast are learning to their cost. The rough winter storms batter at the light, sedimentary soil of the bluffs, sometimes eating away several yards a year. At Glass Beach, as the sea devours the soil shoved over human refuse, it also uncovers glass, ceramics, scrap metal, and just about everything else that could be thrown away. Winter waves wash junk out of the bank, corrode it, batter it, beat it until garbage becomes beautiful, or at least, intriguing. Among the natural sand and stones and bits of abalone and other shells which comprise the beach lie pieces of glazed dinnerware–Blue Willow, Fiesta Ware, and Fire King are recognizable–with patterns intact but edges ground smooth. The remnants of leather boot heels and soles are polished with a patina only the sea’s stropping can give. Hunks of metal, fused by heat and rust, tumbled in wave action against stones, wear until they look like free-form works of art created by a talented metalsmith. But more than anything else, there is glass: greens, browns, clear and cloudy whites, an occasional glimpse of blue, and more rarely, red. 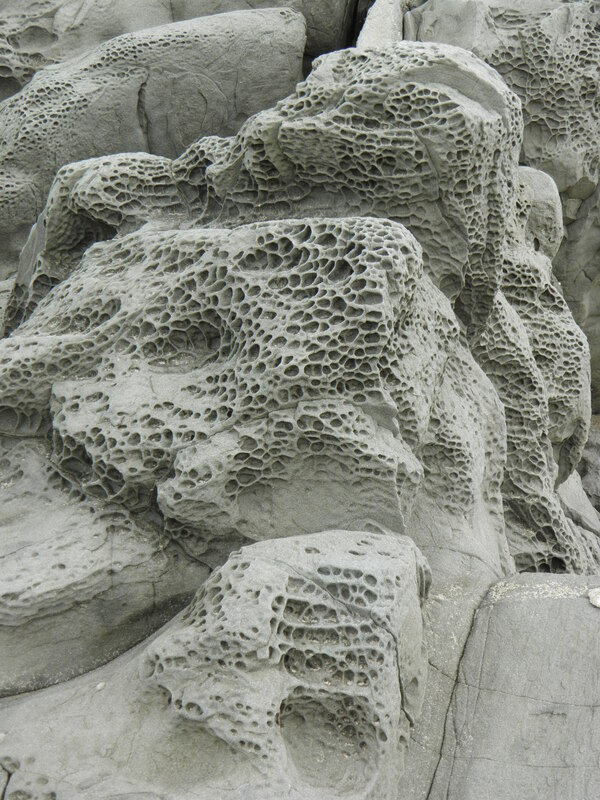 When a wave spills itself onto the shore, the rocky cove is transformed into a treasure trove. It’s a romantic image. Glass glints like gems in the sun when the wave recedes; jewels strewn about like common rocks, as if a pirate’s chest had burst just as it washed ashore and spilled out emeralds and ambers, diamonds, sapphires, and rubies. Tourists love Glass Beach. They bring bags and buckets, shovels and rakes. They carry home pockets full of glass and interesting bits of metal. Some locals spend time on the beach as well, sifting through the sand and pebbles for the rare pieces of cobalt glass, the even rarer ruby. Many street-front living room windows in Fort Bragg sport clear jars of beach glass, and northern California artists have used the detritus of Glass Beach in sculpture, crafts, and jewelry. 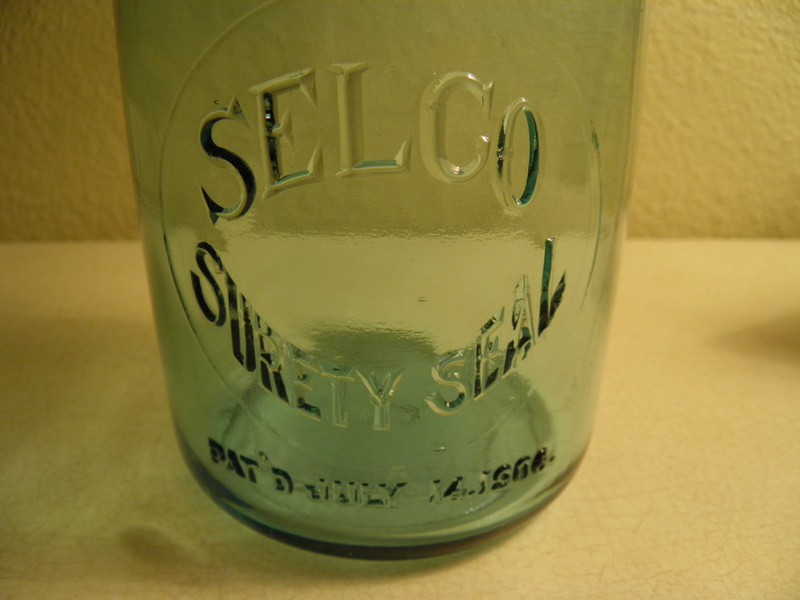 It doesn’t seem to bother any of the glass pickers that they’re sorting through the garbage of an earlier generation. The view from the top of the bluff doesn’t appear to disturb them. Sharp metal and glass protrude from the crumbly brown earth of the bluff, exposed but not yet refined by the tumbling wave action. Old auto parts, pipes, cables, cans, wire, huge bolts, the remains of machines too rusted and corroded to identify. Parts of a washing machine, asphalt tiles, chunks of concrete, rags of cloth, a whole drum containing who knows what: the innocuous side by side with the potentially deadly. On top of the bank, rattlesnake grass and wild mustard grow thick, and ancient mallows bloom from four-inch stalks the size of saplings at their bases. Their age, and the fact that there is so much glass and almost no plastic, point to the time decades ago when the dump was closed. 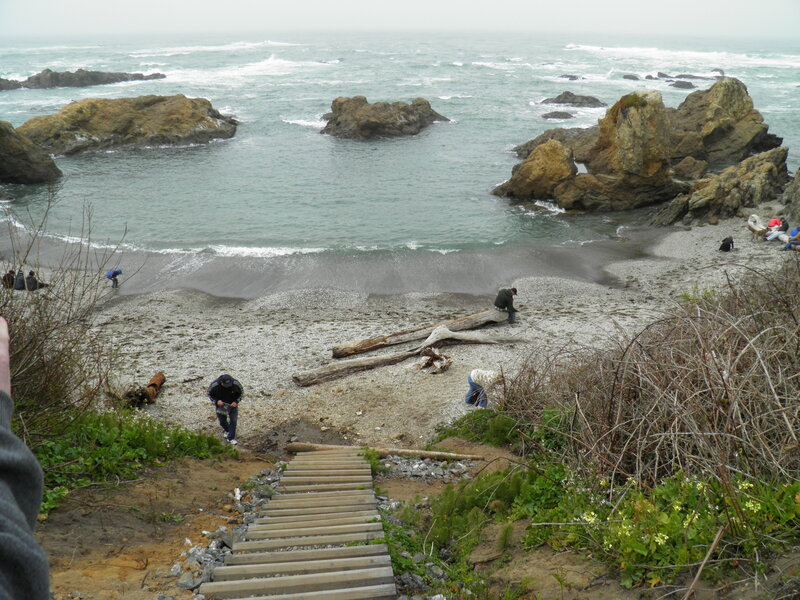 Even after dumping was prohibited at Glass Beach, few residents in Fort Bragg cared about cleaning up something that contributed to the economic well-being of a town which once depended on fishing and lumber, and which, by the 1990s, faced the harsh realities of a depleted fishery and dwindling forest, leading to dependence on the tourist trade. 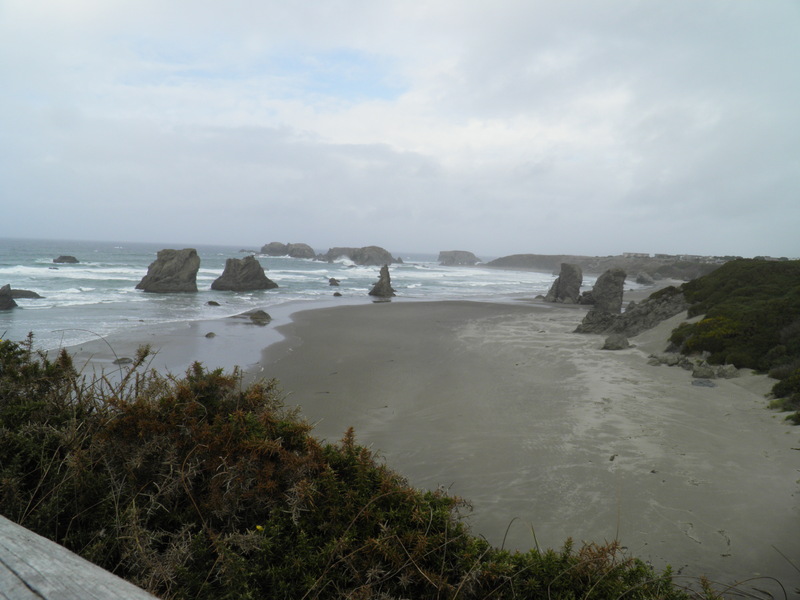 Fort Bragg lies near the northern end of the Mendocino coast. 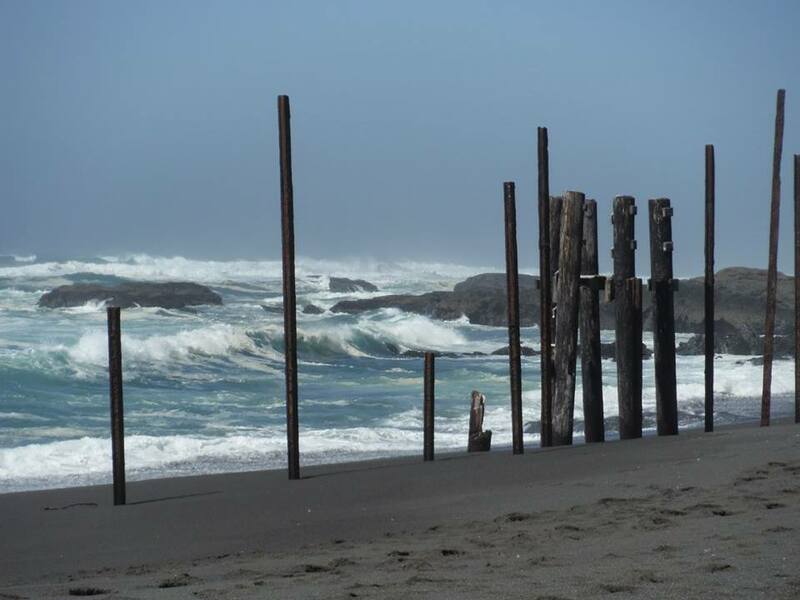 The community needed something to pull the tourists up past the quaint charm and art galleries of the town of Mendocino just to the south. Glass Beach helped. On my semi-annual trips to the Mendocino Coast, I’ve picked through the glass and other curiosities on Glass Beach for various projects—jewelry, bowl fountains, garden decoration. This time, I join the glass pickers on a sunny day in spring. I’ve come to pick up a particular color of glass, a pale, translucent green. Coke-bottle green. I’m planning to turn the glass into a pair of earrings. The jewelry will be a gift for a writer friend of mine who has no earrings to compliment her most priced possession—a neckpiece fashioned of silver and two-thousand-year-old, pale green Roman glass. The Roman glass has an iridescence I cannot match from Glass Beach. That sheen comes from being buried in hot desert sands on the other side of the world, in another dump, in another millennium. 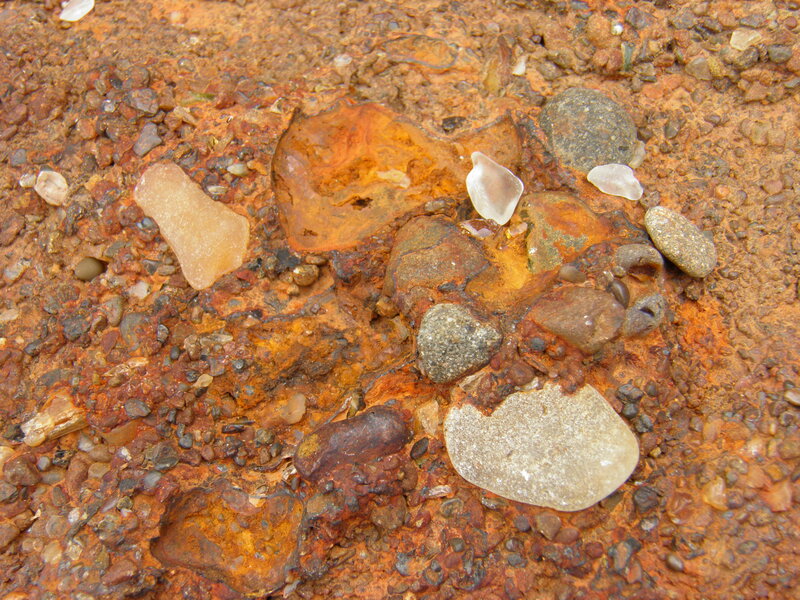 Silicates in the sand bonded with silicates in the glass, which was once sand itself. 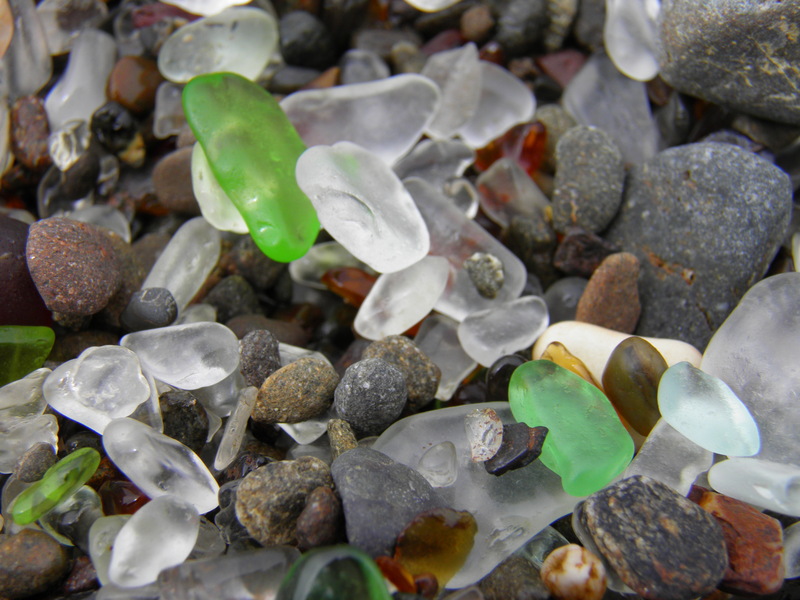 Because of the relentless sea, Glass Beach glass will never acquire that opalescent patina. As I sort through handfuls of sand and glass and metal fragments, setting aside a copper button top from a pair of Ben Davis jeans—the slogan, “Can’t Beat ‘Em,” still legible: a testament at least to the durability of the fastener, if not the jeans—my eyes look for the right color, the right shape. The sun is warm on my shoulders, and the hum of conversation between pickers sounds in counterpoint to the deep, bone-felt surge of the sea. There is something soothing about the activity of sorting glass, searching for that perfect piece. The eyes and fingers look for patterns, leaving the mind free to wander, to wonder over philosophical questions, perhaps to find other patterns. 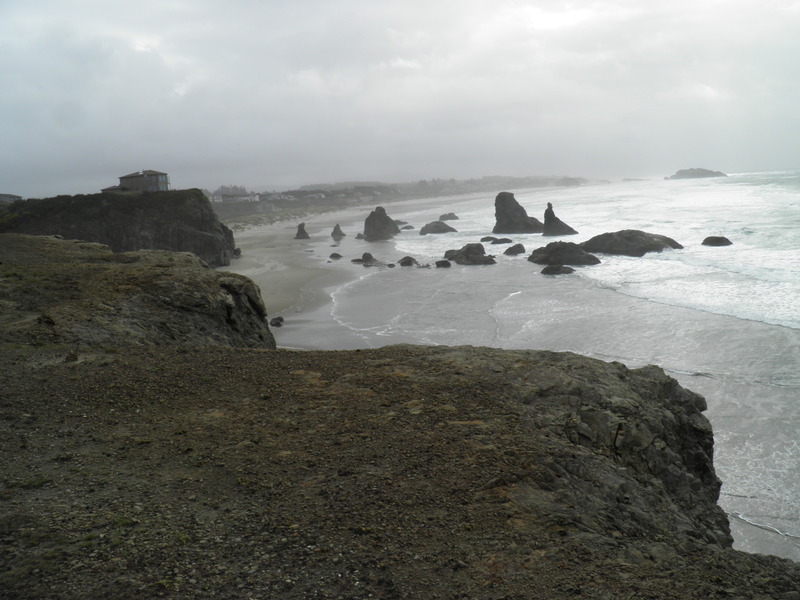 The town of Fort Bragg has changed since I began to visit here regularly in the 1980s. Bay Area influence is creeping slowly northward. Inns and trendy little restaurants advertising California cuisine have cropped up to lure tourists from the city and provide them with the kinds of accommodations and dining experiences they are accustomed to, and shops with expensive gift and clothing items line Fort Bragg’s main street, slowly shouldering out the older businesses which once catered to locals. 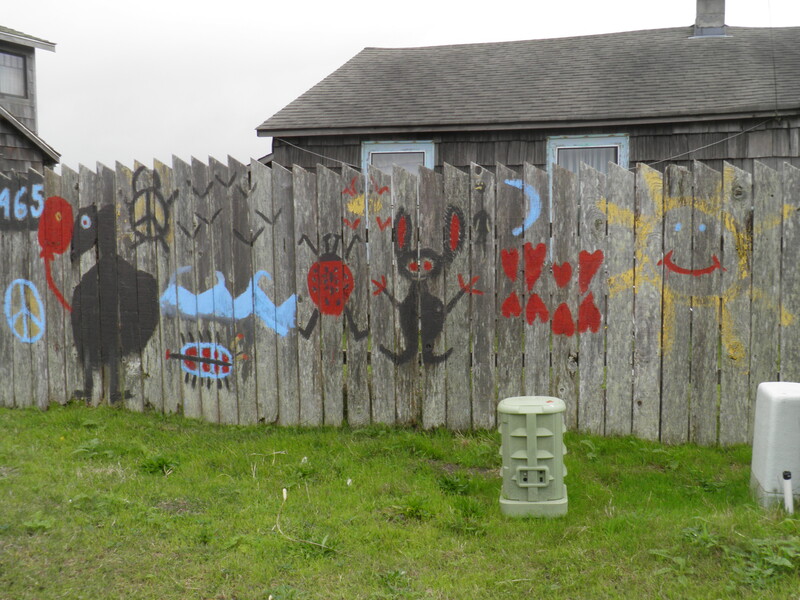 Those migrants from the city have brought a new environmental consciousness to the north coast. 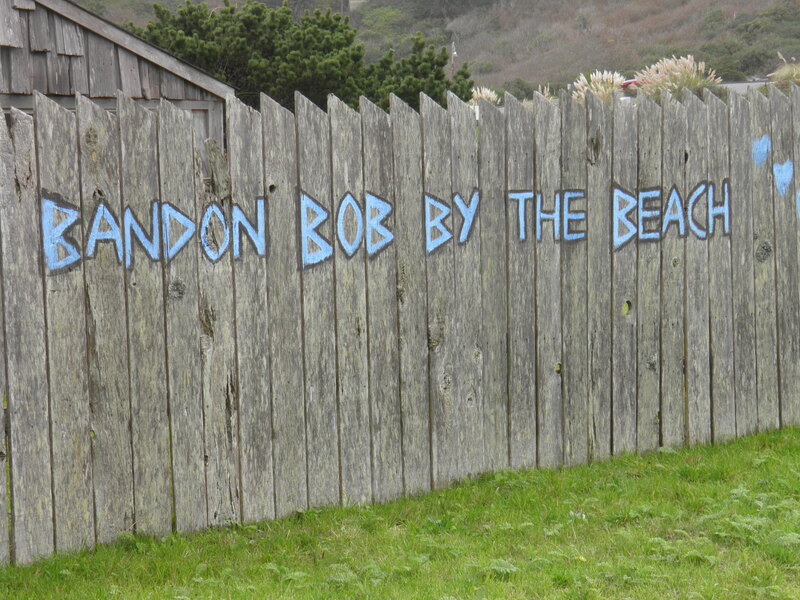 Today, when I arrived at Glass Beach, I found graffiti spray painted in foamy white letters on the retaining wall that holds part of the bank back from the sea. “Litter Beach” the words spelled out, and under that, “Denial?” In those words, and in the local paper, I read of a push for a Glass Beach clean-up. 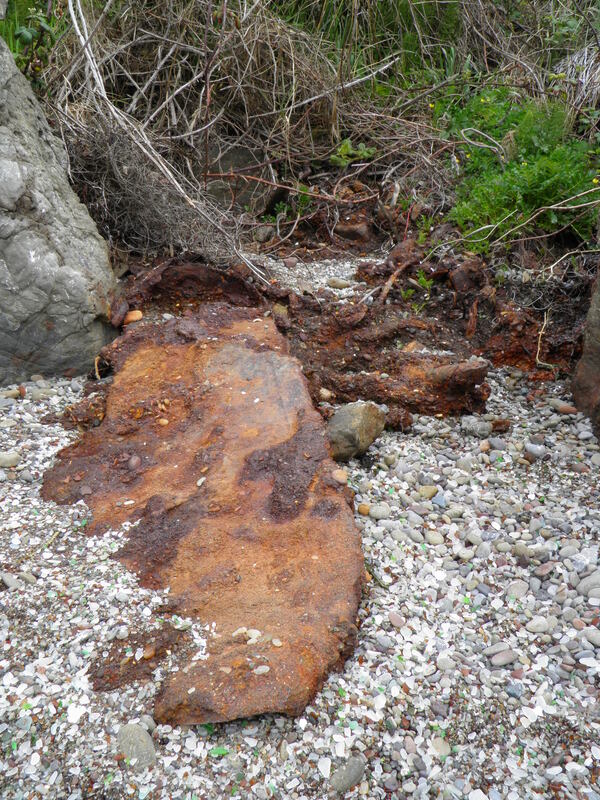 There is no doubt in my mind that the unexposed junk buried in the bluff at Glass Beach may contain environmental hazards, perhaps toxic chemicals from the area mills, certainly oil from old engines. But I hope the coming clean-up will be judicious, that the dangerous and potentially dangerous garbage can be removed while leaving the innocuous behind. For while it is impossible to ignore the fact that this is indeed a place formed as much from human refuse as it is by nature, only the demands of a very limited perspective can overlook the beauty of Glass Beach. Beauty from garbage. It isn’t such a farfetched idea, after all. The leavings of a thousand cultures lie lovingly encased in glass in our museums—mended pots, worn scraps of leather and textiles, broken implements of stone and bone, horn and antler, cracked vessels of glass. All discarded because their usefulness was ended, now rescued from the midden heaps of vanished peoples by students of human history. To those who visit the climate-controlled cases, beauty is a matter of time and perspective. Later in the evening, after a dive not far from the beach, my husband drops an abalone pearl into my palm. Abalone pearls are usually irregularly shaped and dark, with the same silvery-green, iridescent sheen that colors the inside of the creature’s shell. These pearls are fairly rare but have no monetary value, unlike the pearl from an oyster. Yet abalone pearls have their own unusual beauty. This one is peanut-shaped. As I turn the little pearl over in my fingers, it breaks in two at the waist. Inside one half is a tiny shard of green glass. Beauty or garbage? The question circles around in my mind again as I curve bright silver wire around pale green beach glass to form earrings which will complement another, more ancient piece of dump glass. Perhaps beauty and garbage are always a matter of time and perspective. 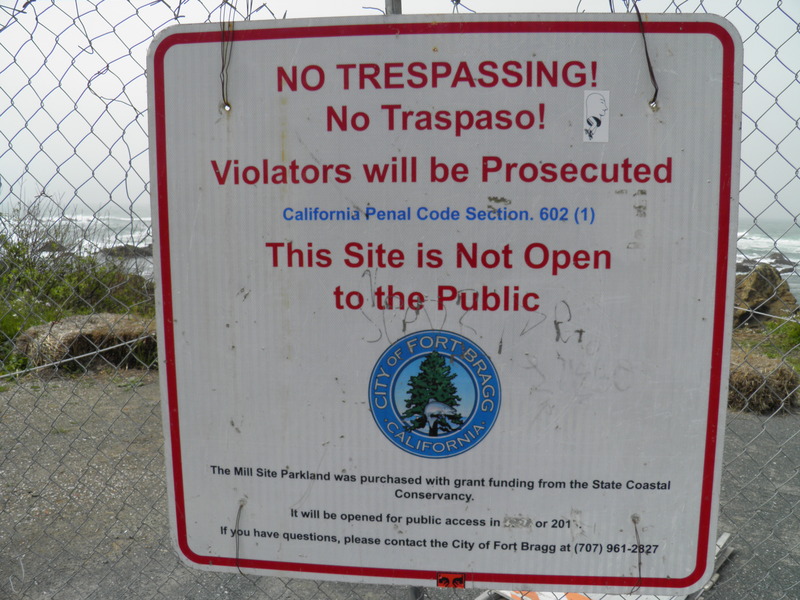 Since this essay was written, there has indeed been a major clean-up of Glass Beach, with some unforeseen consequences. 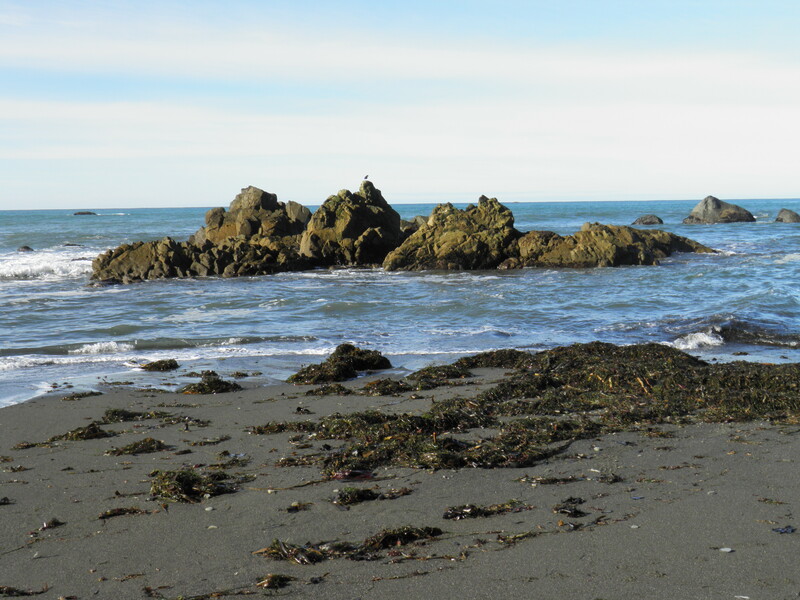 Two coves of Glass Beach were given to the state, to become part of the state parks system. The large pieces of old machinery, like washing machines, have been pulled out of the soft, sandy bank. That’s probably a good thing. Some work was done to try to stabilize the banks and prevent more erosion, and you don’t see barrels of unknowns peeking out of the dirt any more. Much has changed at Glass Beach since our last visit here two years ago. 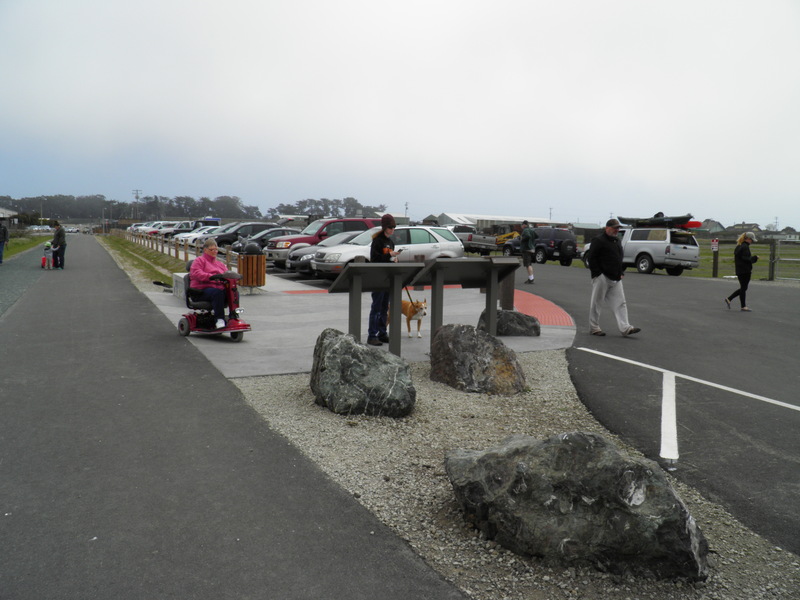 The area around Glass Beach has now become Noyo Headlands State Park and is under development with a paved parking lot and paved paths. I’m sure it won’t be long until what was once a dump and which has been open tourist access for decades will become a fee area. 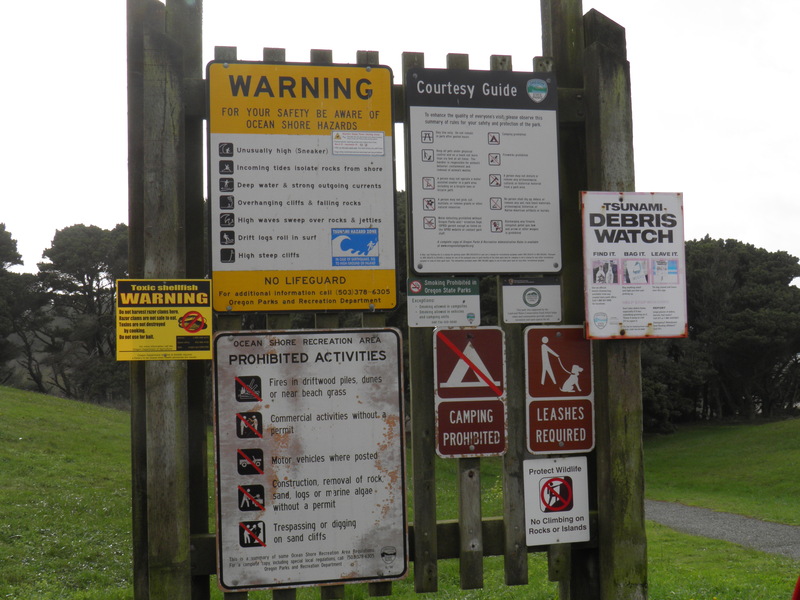 Many of the coves previously accessible have been roped off, and there are warning signs posted everywhere. People seem to ignore them at will, as we did, crossing a rope barrier to descend a set of wooden ladder stairs to a cove where glass is abundant, as it used to be on the main beach before the big clean-up. The tide was in, but we still had plenty of glass to work with, and the signs I’d seen previously that prohibited glass collection were gone. 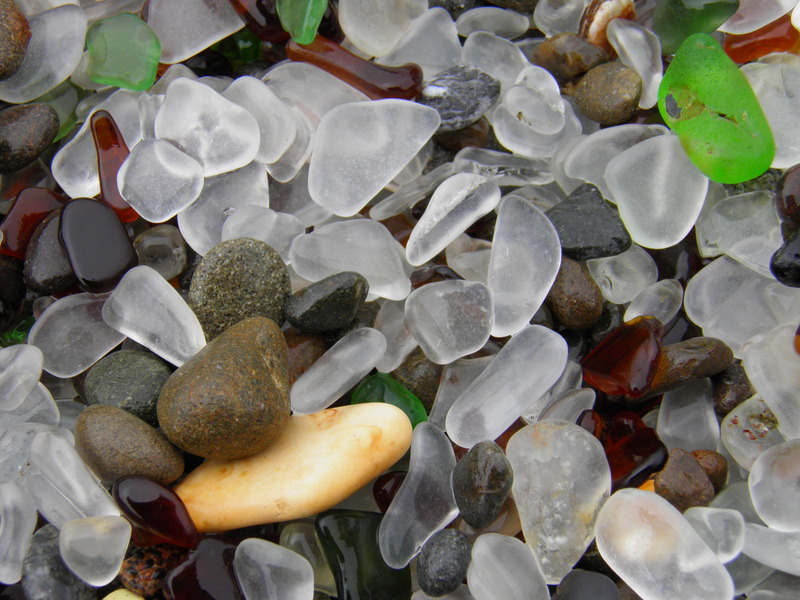 Evidently, the state and county governments are of two minds about Glass Beach and glass collecting. 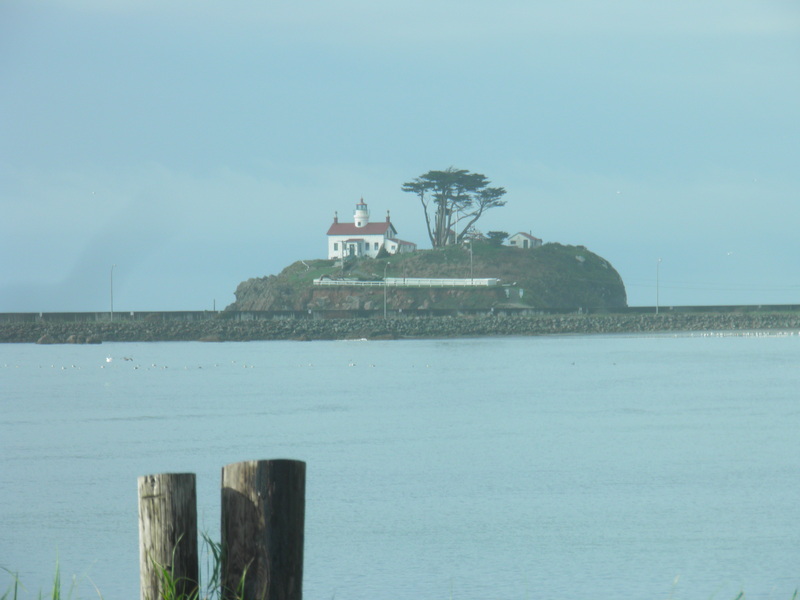 Captain Cass, of the Glass Beach museum, says that the state cannot regulate glass collecting below the high water mark, and therefore, all glass collecting is legal. We went with that. This time, we were collecting glass for our friends, whose daughter is getting married this summer. Karen, the mother of the bride, intends to create tiny succulent gardens in wine glasses for party favors, and a few polished pebbles from MacKerricher State Beach and a few pieces of glass from Glass Beach will adorn each little garden. We spent a pleasant couple of hours sorting and picking glass. As for me, I’ve got a different project in mind. I started finding quite a few pieces of heart-shaped glass, so I’m thinking about jewelry again. I also picked up a number of larger pieces of glass for a mobile. The place really gets my creative juices flowing. And here’s an odd fact. 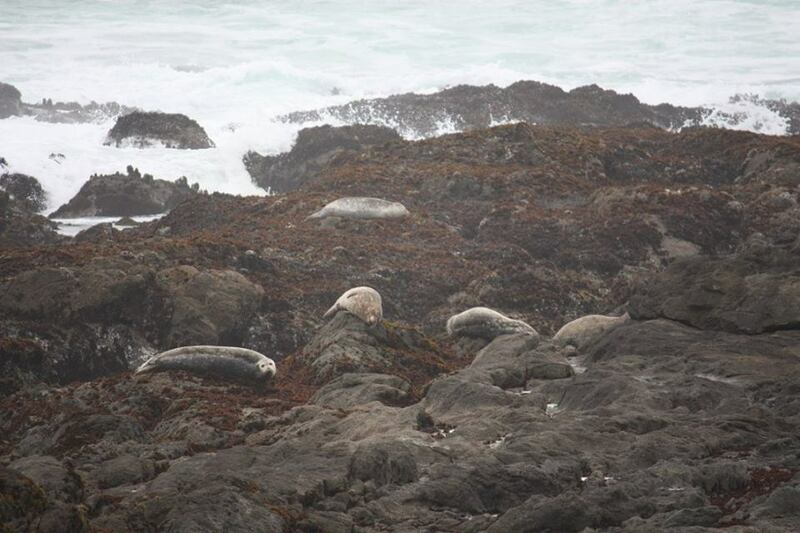 The biodiversity offshore is greater at Glass Beach than at any other point along California’s coast. Some biologists speculate that it’s the breakdown of the glass that feeds this biodiversity. Turns out, some people believe that old dump glass is a good thing for the ocean. Beauty from garbage. Nature will always find a way. 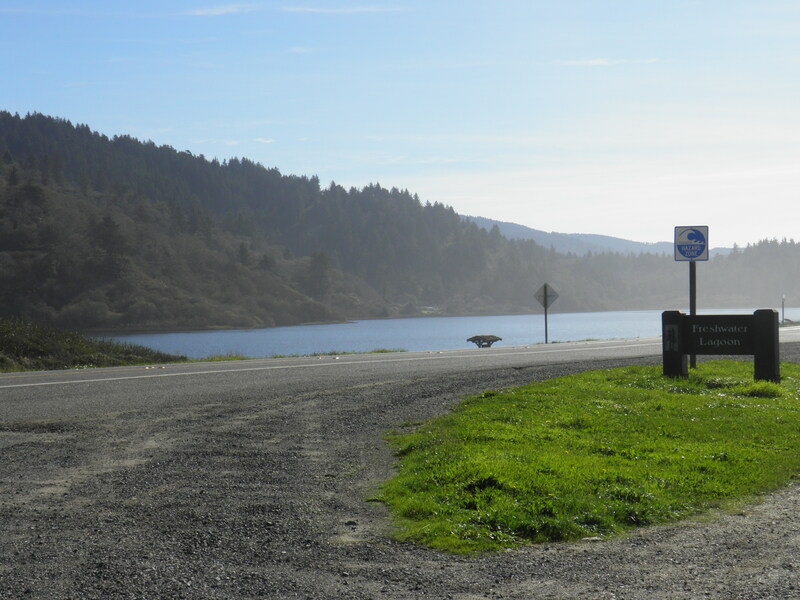 Yesterday, I drove south from Crescent City along Highway 101 to Arcata, then took Highway 299 east to Redding, then Highway 44 east to Lassen County. It was a beautiful day for travel. I wish I’d had time to stop and take more pictures. I took this particular route home because I wanted to stop in Klamath, just 20 miles south of Crescent City, and see my dad. I took him some crab, and I showed him the pictures I’d taken of Scholls. I had loaded them on my laptop, so they were large enough for him to see. To my delight, he too recognized the curves of the Scholls Ferry-Sherwood Road that ran past the farm. He knew where the store should be in relation to the road that ran up to the farm, now called SW Scholls Drive, and where the bridge would be from the intersection in front of the store. He actually confirmed my belief that I found the farm. To say I was surprised is an understatement. I thought he would pooh-pooh and tut-tut and tell me that there was no way to be sure. And he didn’t do that. He seemed pleased that I’d found the place, and pleased to see the pictures, and pleased to talk about it. It helped that he was sober and glad to see me, although an hour’s visit is about all he can handle. After that, you’re just cutting into his TV time. I asked him when he thought the Sanders’, Dora and Maynard, who owned the farm and were also our landlords in Klamath, sold the farm. 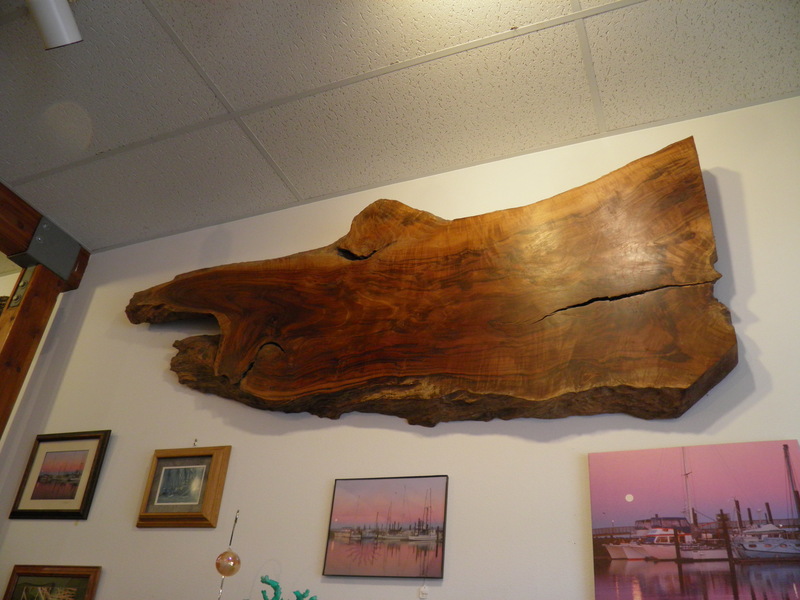 He said he thought they sold it two or three years later, after we moved back to Klamath late in the fall of 1963. We actually lived on the farm less than a full year, although my brother and I went to part of two grades of school at Groner Elementary in the spring and fall of 1963. 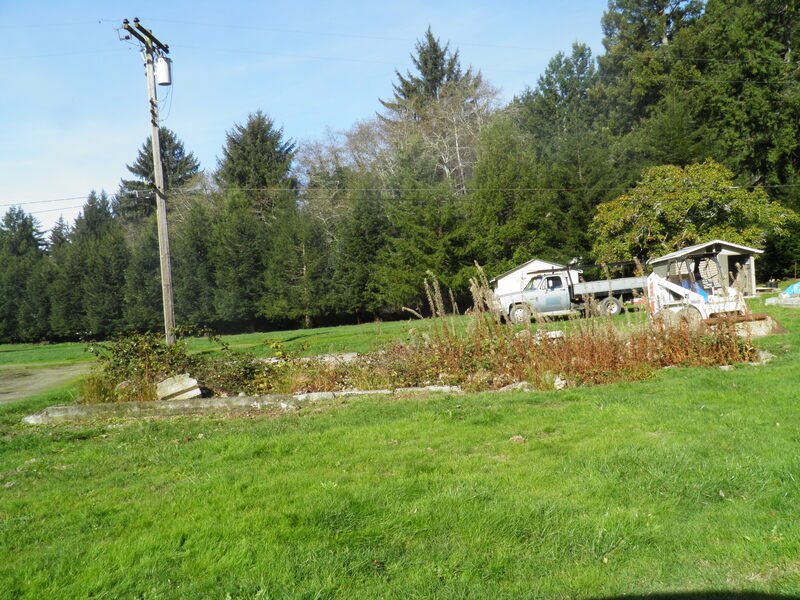 Dad said that Maynard and Dora were never able to make a success of the farm, although he thought they might have leased the farmland out to other farmers for a few seasons. They had to sell it after a couple of years, and that might have been when the seed and feed business that’s there now went in, and eventually, the other homes. Dad says the little white farm house and the barn were old when we lived there, so it didn’t surprise him that the buildings had been torn down and that other buildings had been put up in their place. 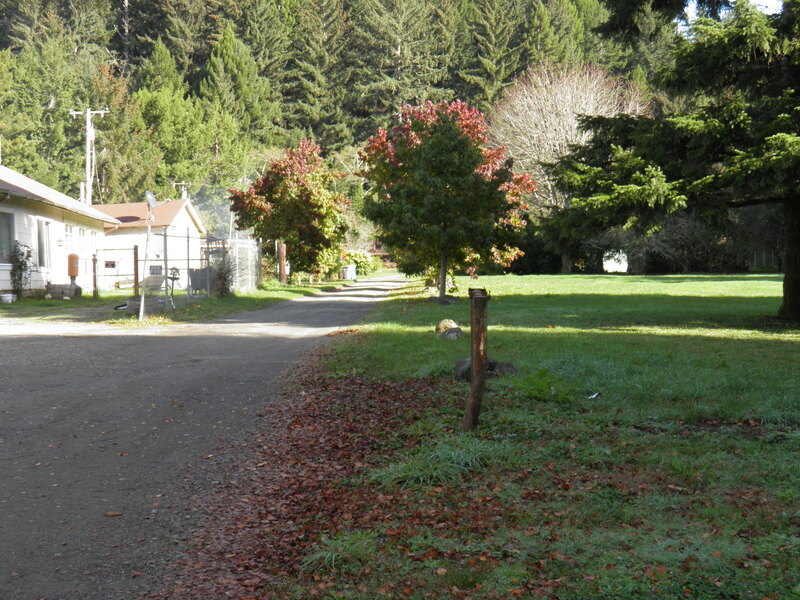 When we moved back to Klamath, we didn’t at first move back to what was then called Sanders’ Court. Dora and Maynard owned several acres of land with a bunch of shacky little houses on them. Their house was a big, beautiful, Colonial-style farm house with a veranda that ran all the way around the house, and Dora had a huge vegetable and dahlia garden west of their house that you could see from the highway. 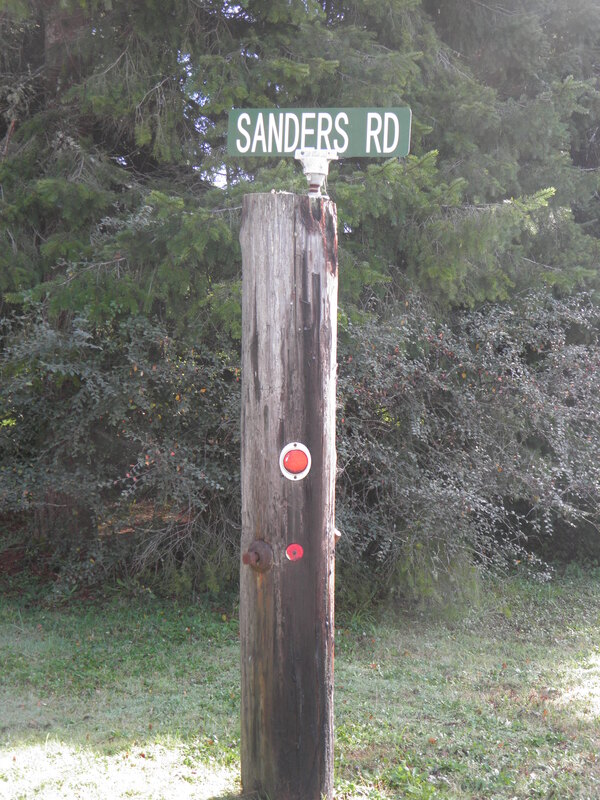 We had lived in a duplex at the end of Sanders’ Road, on the north side of the road. The duplexes were originally built with two bedrooms and one bathroom. When we first moved back to Klamath in late 1963, the duplex in Sanders’ Court we’d lived in since I was two was occupied by other renters. We moved into another duplex right across the highway in a group of small rentals owned by some people named Sage, so it was known as Sage’s. We lived there for a couple of years, I believe, maybe until 1965. I know we lived at Sage’s during the tsunami that hit Crescent City in 1964 and the great Christmas flood of 1964. We had gone to visit relatives in Oklahoma for Christmas that year and couldn’t get home for several weeks because there were no bridges left between Sacramento and the California-Oregon state line. We stayed with relatives in Winters, California, waiting for temporary bridges to be built, and I went to school for a month at the elementary school there. When the renters who lived in “our” house at Sanders’ Court moved out around 1965, we moved back into it. My parents had a long friendship with Dora and Maynard, and Maynard was getting older by this time. Dad helped him out around the place with repairs, like tarring roofs, in exchange for reduced rent, and when I was about 12, Dad built a third bedroom and bathroom onto the back of our side of the duplex. That was mine and my sister’s room. We had our own woodstove in our bedroom because it was so far from the woodstove in the living room. And still sometimes I would get so cold, I had up to ten quilts on my bed in the winter. I was a scrawny kid, just skin and bones at that time because I’d been through spinal fusion surgery for scoliosis and had been in a body cast for 10 months. Our neighbors on the other side of the duplex at that time were the Darbys. Tom Darby has done a lot of writing about his years as a kid in Klamath, and his book is called “Growing Up Klamath.” It can be found on Amazon and as an e-book. When I was 16, Sanders’ Court got to be too much for Dora and Maynard to handle. They sold off the north side of it, our side, to a couple named Pritner. Mr. Pritner was a mean old son-of-a-gun. He decided he wanted to live in “our” house because it now had three bedrooms and two bathrooms, so he served an eviction notice. My parents decided it was time to buy their own house, if they could find the money, so they borrowed $9,000 from my mother’s sister and bought a two-bedroom, one-bath house with an attached shop on Lonesome Road. My dad added onto the house and still lives there today. As I was getting ready to leave Dad’s yesterday and head for home, I asked him if the duplexes in Sanders’ Court were still there. It had been several years since I’d been down that road, and at that time, the houses were still standing, although I don’t think anyone lived in them. So I gave my dad a big hug, told him I loved him, and headed off down the road to find another piece of my childhood. As I drove up Sanders’ Road, I noticed how different it looked, but still recognizable. The house on the corner of the frontage strip owned by the Fortaines where my aunt and uncle and cousins lived for some years was still there. I could see where Dora’s garden and the Sanders’ house had been. And at the end of the road, there was the foundation for our duplex. A pile of boards lay nearby, and a pile of scrap and brush was smoldering. There were two men tending the fire. I called out a greeting, and one of them came over to speak to me. He was the owner of the property now. I told him that I’d lived there for many years as a kid, and asked him if I could take some pictures. He didn’t mind at all and was happy to talk to me about the changes that had taken place over the years since he’d bought the property. He’s had it 27 years, so he must have bought it just after Dennis and I and our family left Klamath for Lassen County. He told me that the Sanders’ house had burned down, and it had sure made him sad. 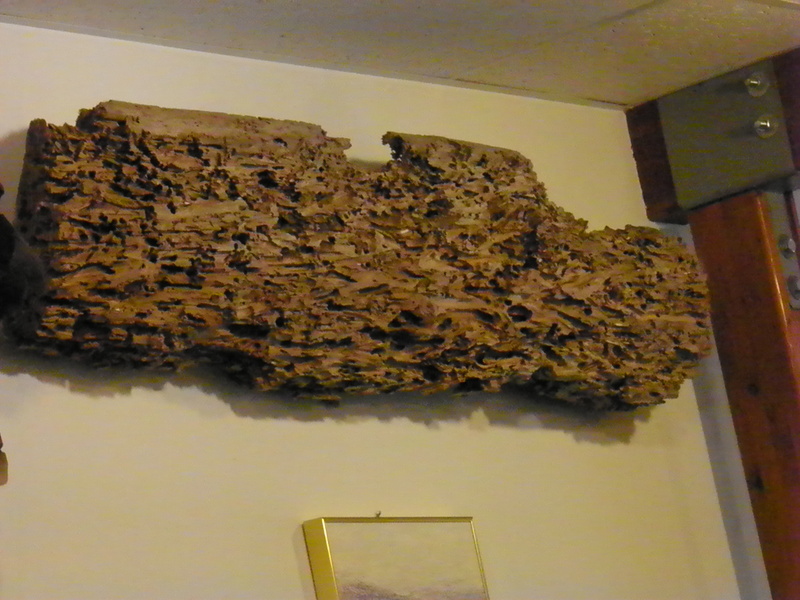 “There was a lot of redwood in that house,” he said. I told him that I’d lived in the duplex on the right. “That one had three bedrooms and two bathrooms,” he said. 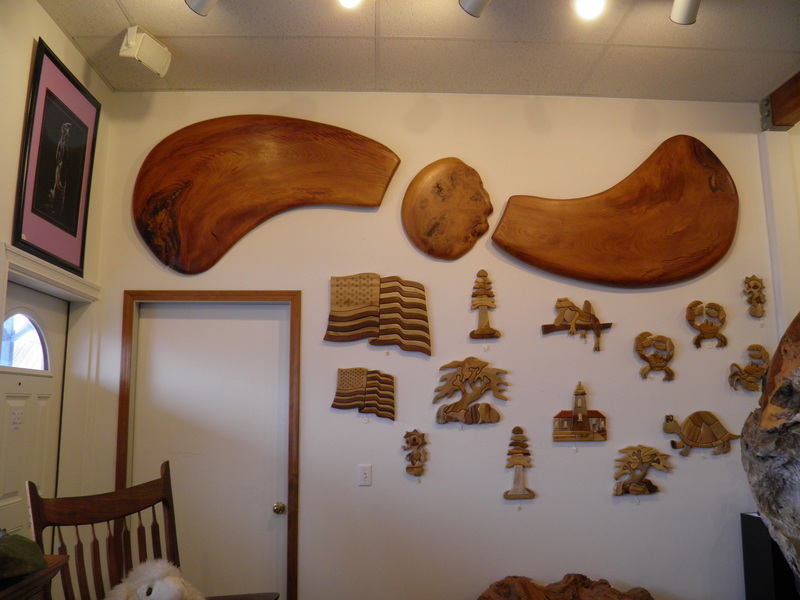 “That room had a lot of redwood in it too,” he said. 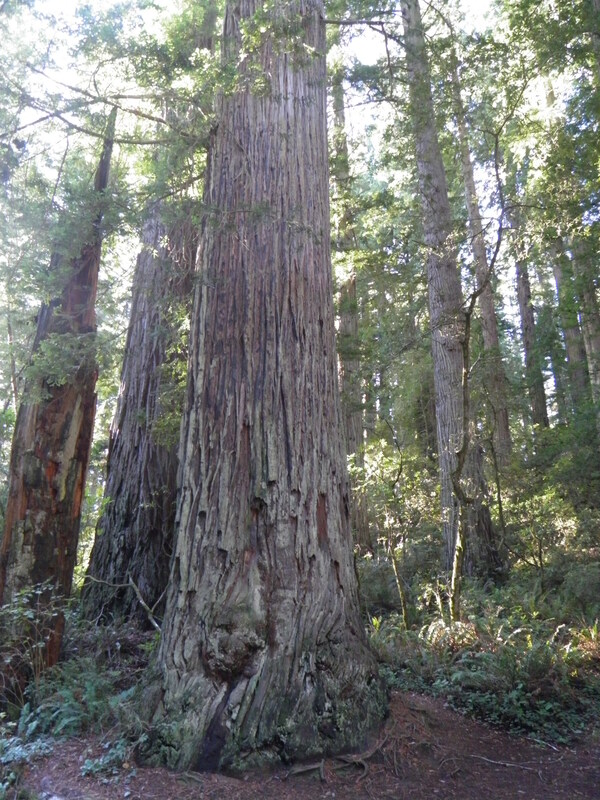 “I saved all the redwood two-by-four framing, all I could.” I was so glad to hear that, and I told him so. As we were chatting and looking around, I gave him my card and my name, and he told me his name, Alfred, only he goes by Al. He also gave me his last name, but it went right out of my head by the time I’d gotten back in the car. Al asked me if the old cabin was here when I lived here. I was really surprised that it was still standing, because it was old when I was a little girl. A family by the name of Beaver lived in it then. Al told me that it was the oldest house in the whole area, and that it had once been across the slough where the Methodist church sits now. 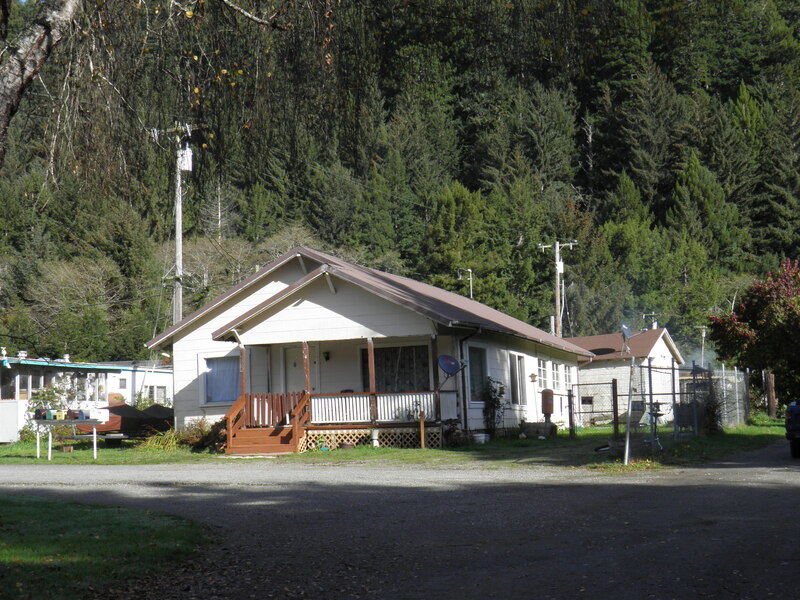 When they decided to build the church, Al said, the cabin was moved to Sanders’ Court. That must have happened before my time, because I always remember it being there. 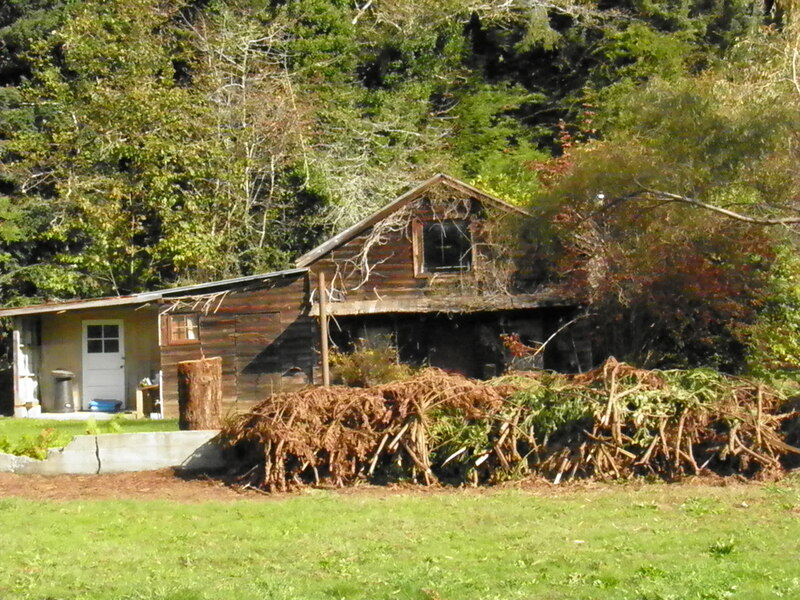 The fact that it is still standing is a testament to old time building skills and good redwood lumber. Al has plans for Sanders’ Court, but it’s slow-going, working by himself most of the time. He’s also been remodeling his house up on Requa Hill. When he mentioned living on Requa, we got to talking about who we knew in Klamath, and it turned out that he was neighbors and friends with our dear friends, the Fortinos, who recently sold their home up on Requa Hill and moved away from Klamath. And so, once again, I prove to myself that the corner of the world I live in is a very small place, and that there are friends to be found almost everywhere if you’re just willing to talk to people. 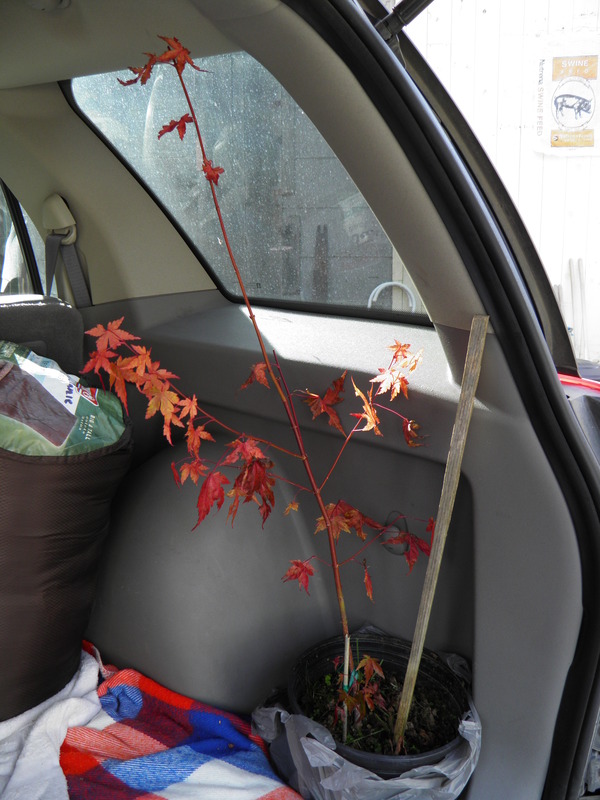 Alfredo sent me on my way with a Japanese maple in a pot. I’ve been wanting one for the yard, and it will serve to remind me of Alfredo and Sanders’ Court, of my childhood in Klamath, and of learning in my adulthood to grow bolder instead of older. I headed off down the coast at about 12:30, so I knew I wouldn’t get home before dark, but at least I’d be in familiar territory. I love driving along the coast and into the mountains, along those mighty rivers, but you do have to be careful. 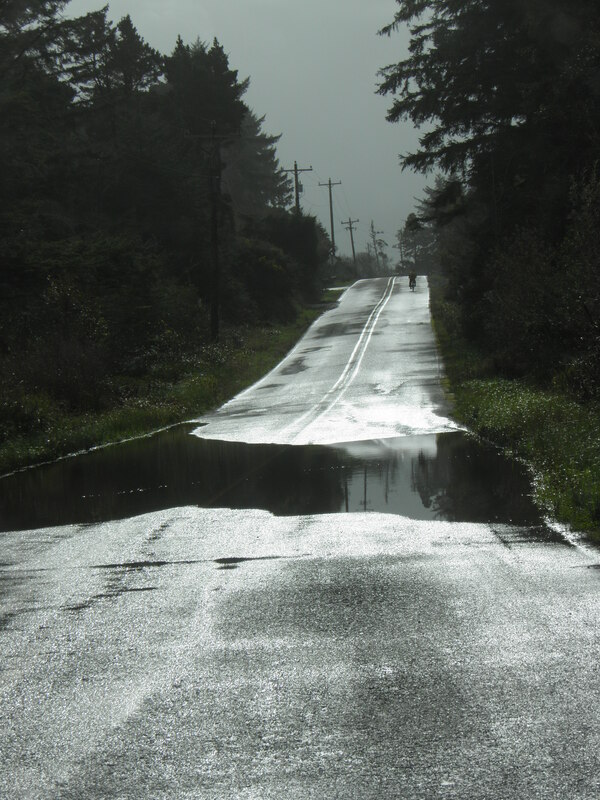 On the coast, Highway 101 keeps trying to fall off into the ocean. It has, a time or two, in my lifetime, right along here. On Highway 299 into the interior, the mountains keep trying to cover up the road in big slides. It seems like every year there’s a repair project going on. 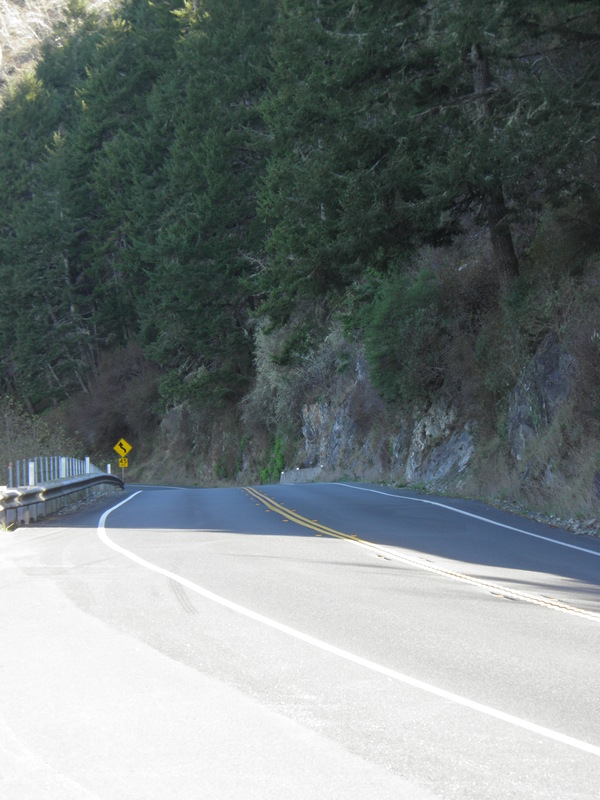 This year, the highway is down to one lane near Salyer, where a huge rock slide came down. I wish I’d had a place to pull off and get a picture of what the engineers and workers were doing to that bluff, but the river is on the other side of the road. There was a guy hanging in rock-climbing harness on the bluff above the slide, trying to secure something, maybe one of those big chain-link nets, into the rock. Traffic through the area is controlled, one direction at a time, by a stoplight. And of course, there are curves. Mile upon mile of curves. Anybody who drives along the coast of California, or into the interior of the state through the mountains, had better be familiar with curves. Fortunately, having lived on the coast and in the mountains all my life, I am familiar with curves. I know how to drive on curvy roads. There’s a grace to it. You brake into the curve and accelerate out of it, letting the centrifugal force draw you around the banked curve, if the road has been engineered properly. There’s a point where you feel the vehicle in perfect balance with the road and the curve. And if the road wriggles and writhes, like Highway 299 down from Buckhorn Summit between Weaverville and Redding, you can develop a rhythm. You can dance with the road. 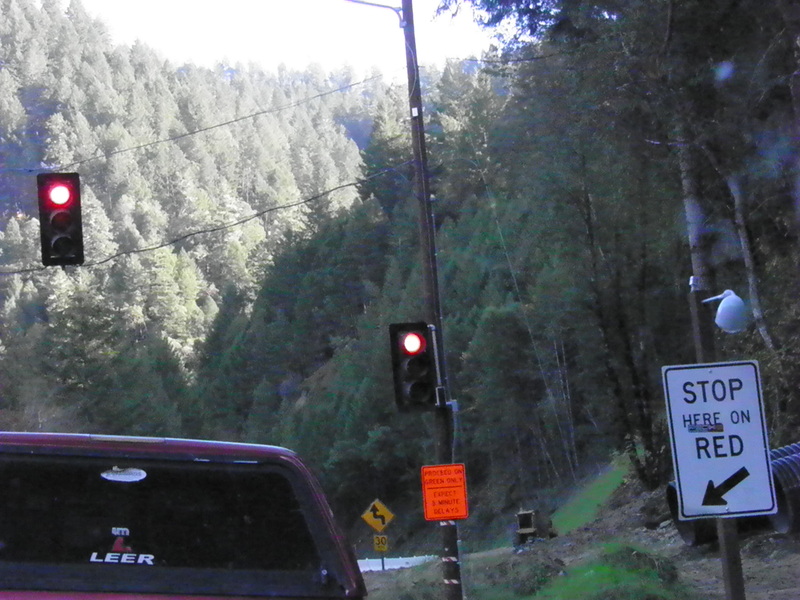 Of course, it helps if there aren’t any timid or inexperienced drivers ahead of you, standing on their brakes all the way down the mountain. But if you just back off, give them room, and don’t crowd them, you can still find the rhythm. Driving in these conditions requires alertness and awareness that anything can happen at any time. But the dance is fun. And it reminds me that I can enjoy the curves ahead in my life. Just use what I know, what I’ve learned, be aware, be alert, be bold, have fun, and I can handle whatever’s around that next curve. In a way, that’s what this whole trip has been about. It’s been a dialogue with myself. Can I handle what’s around the curves? Will I stand on my brakes all the way down the mountain or dance with the road? What’s it going to be? There’s nothing like fresh Dungeness crab. There’s also nothing quite like picking it in the dark. By the time Dennis got our trailer parked and set up, it was completely dark. 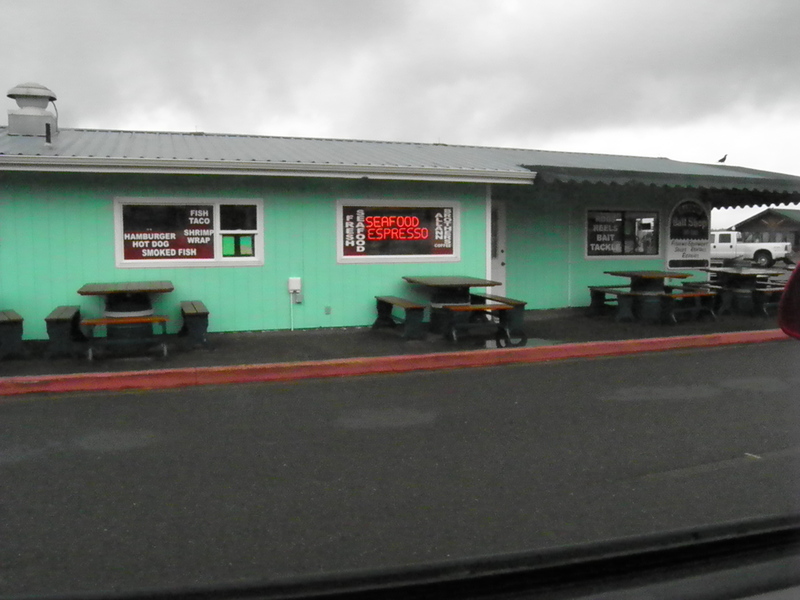 You really don’t want to pick crab at a dinette inside an almost-new trailer with carpet. At least, I don’t! So we moved a picnic table under the awning, positioned two cars with headlights pointing at the table (we didn’t have any lanterns because we aren’t woods camping), and picked crab for a couple of hours, eating as we went. Well, some of us ate as we went. Some didn’t. Everybody has their own way of eating fresh crab. Some people pick and eat as they go. My brother cracks the legs and claws and eats as he goes, then picks the bodies into a bowl and eats them with salad. My husband picked a big bowl full, and then ate it all at once. My sister picked into a bowl a little at a time, ate until she was full, then picked a big bowl to take home for crab omelet this morning. We ate as much as we could hold last night, because you eat while the eating is good. You never know how many crabs you’ll get the next day from the pots or rings you have to go out and pull. You never know if it’s going to be too rough to go out and get them. The small boats couldn’t go out yesterday. The ocean, as my menfolk like to say, was ripped from all that wind. 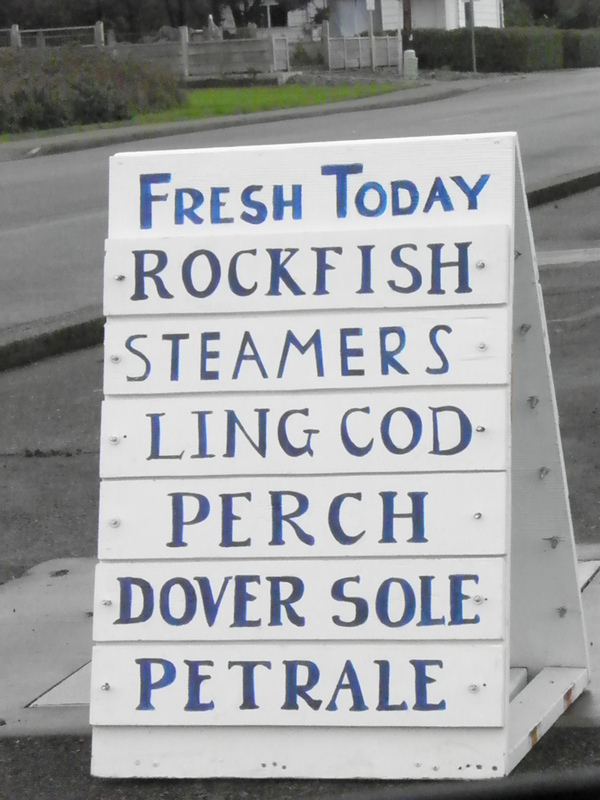 But this morning they’re going with a friend of my brother’s to pull his pots, which were put out two days ago, so they should be bringing back fresh crab for lunch and supper. If there’s more than we can eat for lunch and supper, we’ll pick it out, vacuum seal and freeze it, and take it home. We never take more than a limit and never keep more than we’re supposed to. It’s not worth a ticket. I have little cuts on my fingers from crab shells and salt. I have the utmost respect for people who pick crab for a living, as well as those who go out to the deep water and bring them in for packing. 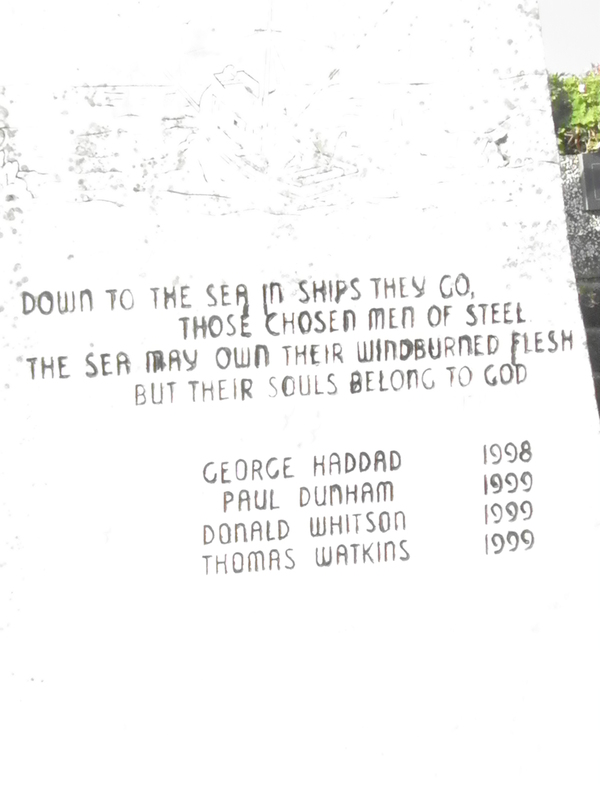 The memorials at the boat basin, refurbished beautifully since the last tsunami, testify that fishing is a hard way to make living. Fishers are hardy folk. Sometimes, they don’t make it. Last night, I was baptized by crab several times (that’s when you crack a leg or claw and get squirted with crab juice), so I put aside my fisherman’s sweater and dirty jeans for today’s picking. By the time I get home, those clothes will smell to high heaven. But I’ll have been in crab heaven for three days, so I’ll bear with those smelly clothes all the way home. Today, I get to spend some time with old friends before I come back to pick crab for lunch and dinner. 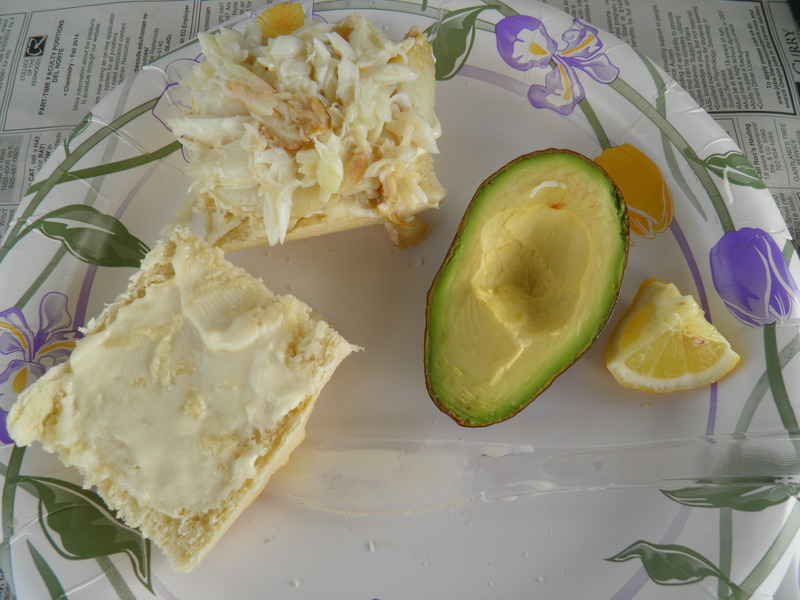 I’ll tell you, there is nothing better than hot crab sandwiches. Pull ‘em out of that boiling water, let them cool off enough to handle, pick one and put the meat on French or sourdough bread spread with mayonnaise, squeeze a little lemon, and find crab heaven. Tonight from my room, I can really hear the ocean kicking up. It was very windy today, so windy I couldn’t hold the camera still enough to get clear shots when I was down by the beach. I’m glad I decided to stay over in Bandon one more night. I had a day to rest and relax and not drive, and I don’t have to sleep on the sofa bed in my brother’s travel trailer tonight. 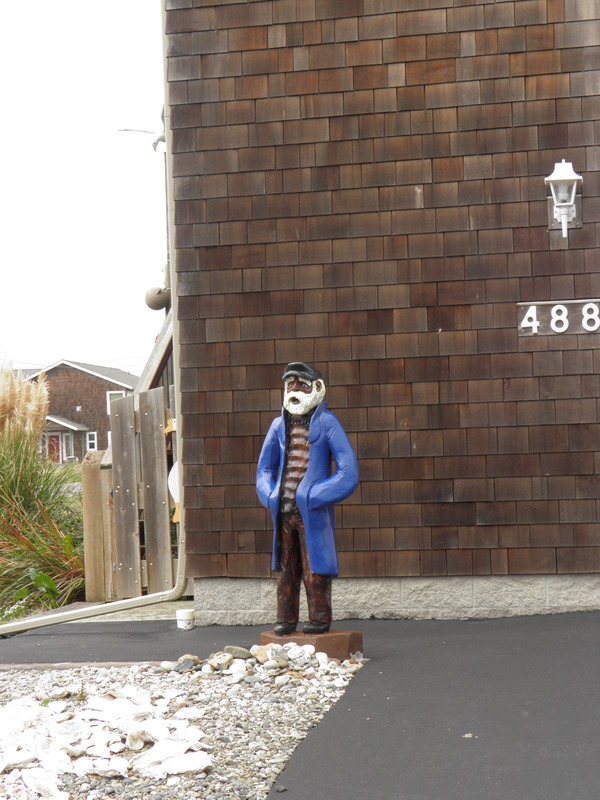 I’m staying at the Best Western Inn at Face Rock, down towards the end of the Beach Loop Road. So I drove down to the south end as far as I could go before I hit a flooded area, and then I drove back the other way. The bicyclist rode right through. 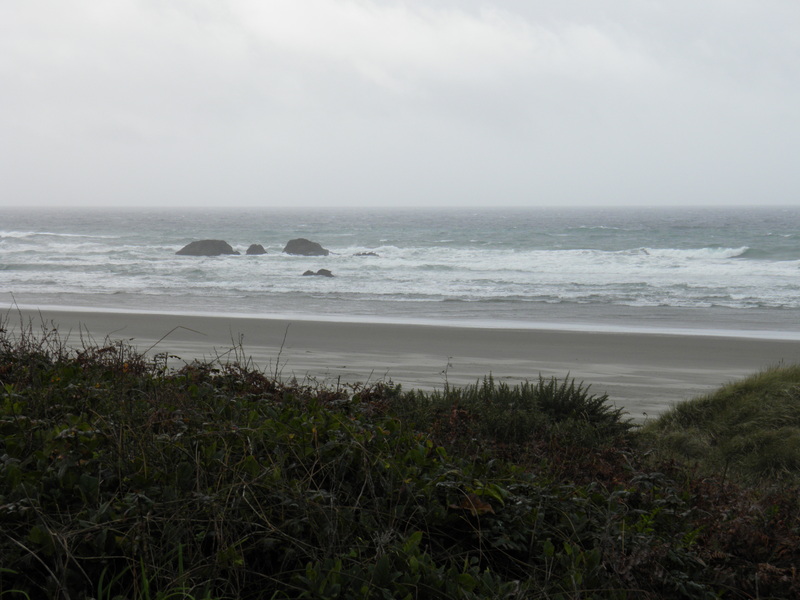 I went down onto the beach this morning, when it was just sprinkling, but the wind was so strong, I couldn’t stay long. 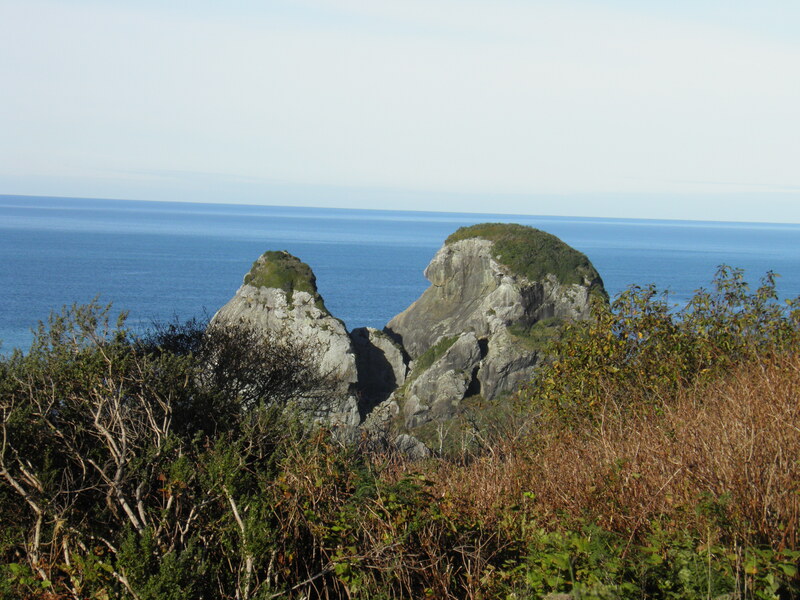 I did get some photos of Face Rock. For those who don’t know the story, here it is. 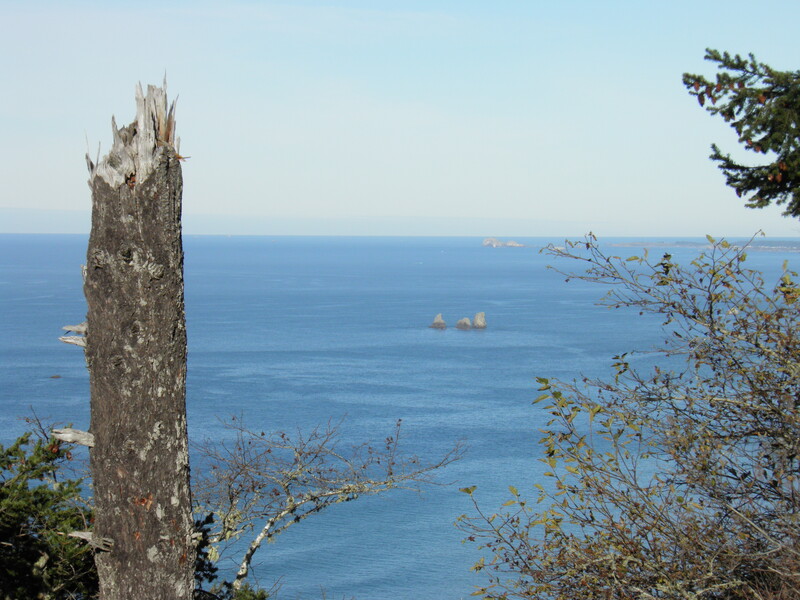 One night when the moon was full and shining on the water, Ewauna, the daughter of Chief Siskiyou, who was visiting the coastal tribes for a big potlatch, went down to the sea they called Wacoma and went swimming. With her went her dog, Komax, and she carried a basket containing her cat and kittens. The evil sea spirit, Seatka, was not pleased that she did not fear him. He tried to make her look into his eyes, but she would not turn her face from the moon. Komax bit Seatka on the hand and howled, his nose to the sky. Angered, Seatka threw the basket of cat and kittens into the sea. The princess, dog, and cats all turned to stone. When it started to rain more earnestly, I decided to follow the Beach Loop down into the port area. 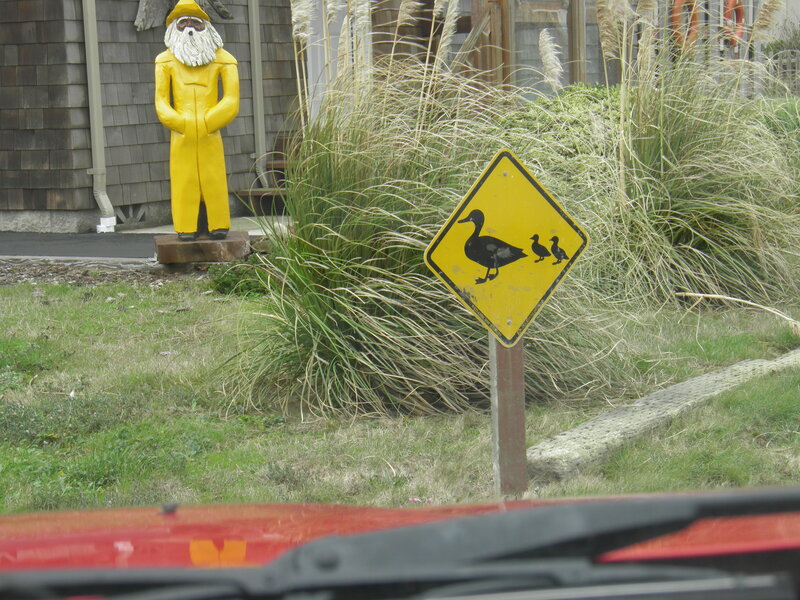 I went down Jetty Road first and saw some amusing things. 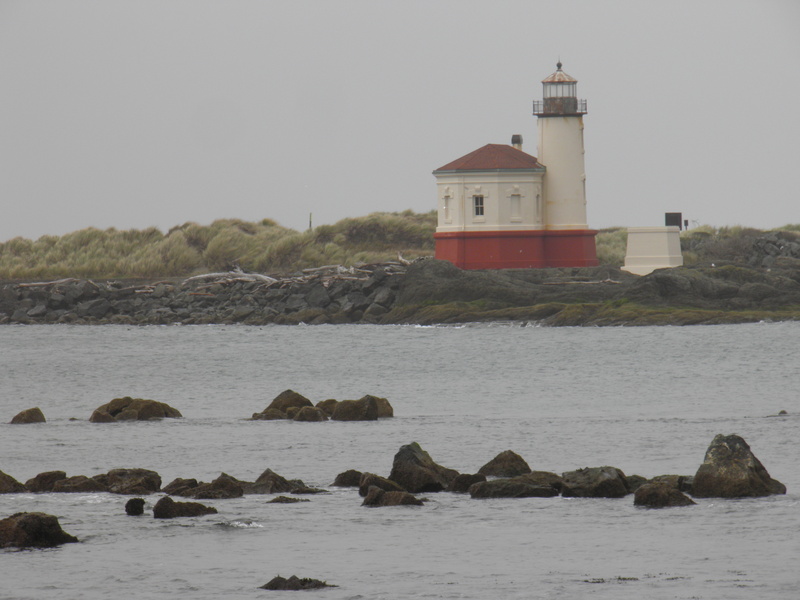 You can also see the lighthouse from Jetty Road. There are lots of shops down in the port area, and I spent the afternoon in and out of a few. I visited with Peggi Towne at the Olde Towne Seafood & Market. There’s a farmer’s market there on Fridays and Saturdays, and during the week, Peggi and her husband, John, sell fresh fish and local meats. 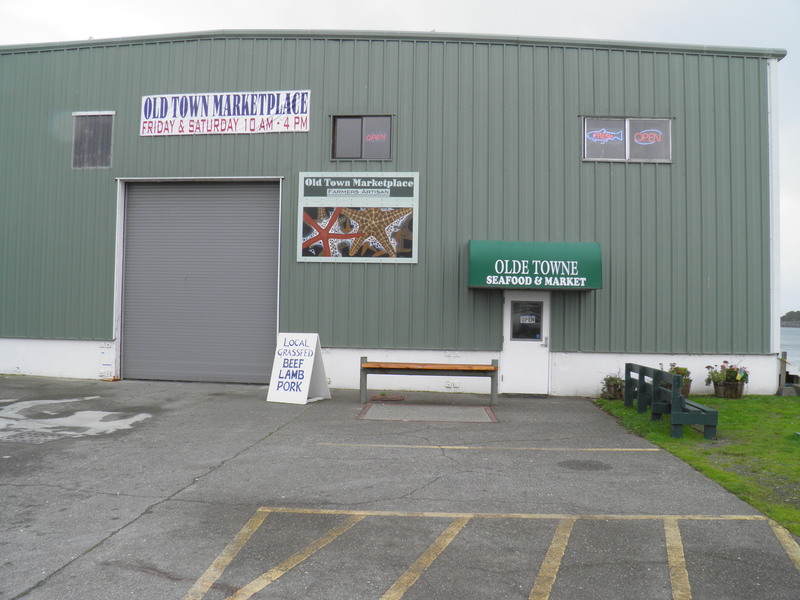 It’s a wonderful place, and I enjoyed talking with Peggi and hearing about the market. Just a little farther down was a little tackle and bait shop that also sold fried seafood. Oh, yes, I did. I believe the owner’s name is Diane (according to Peggi), and when I asked for a substitution on the combination plate (I cannot eat oysters), she gave me the best calamari strips I have ever eaten. They were so tender, it was almost like eating tofu, only it sure didn’t taste like tofu! 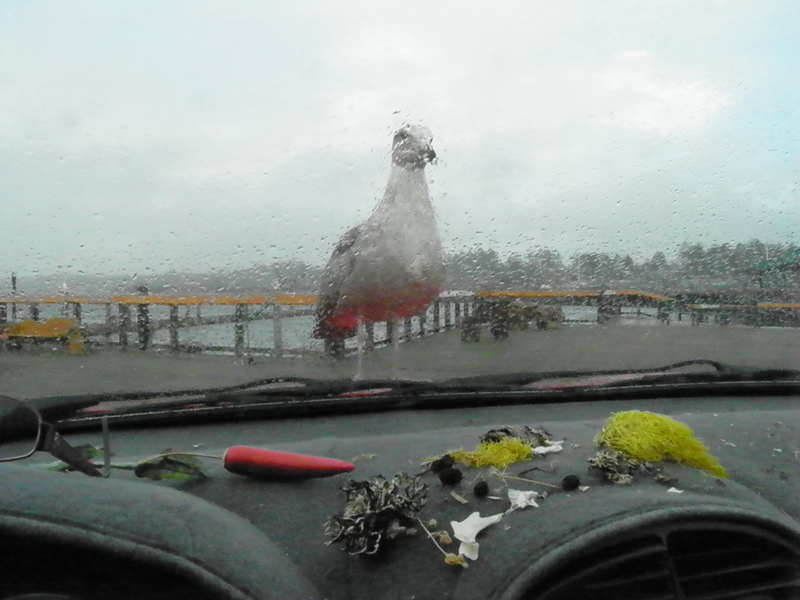 I ate in my car, because it was raining and windy again, and a visitor landed on the hood of the car and tried to stare me into a share of my lunch. He stayed there for a good five minutes, watching me eat, cocking his head this way and that, then flew off, then came back and landed on the roof of the car. I could hear him walking around up there. When I was finished, I threw my two shrimp tails out the window, but I don’t think my friend got either of them. 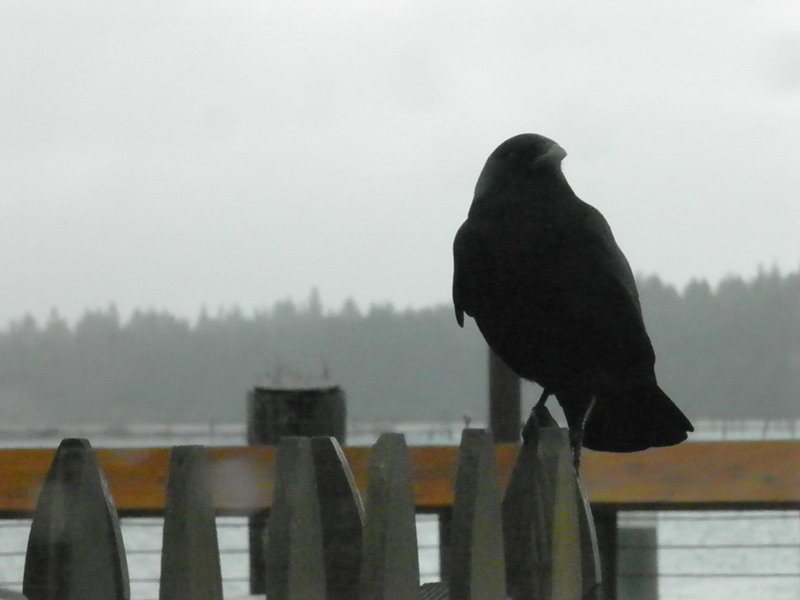 A crafty raven flew down and got one, and I think a mature seagull got the other. I felt sorry for my friend, but I didn’t have anything else to give him. After lunch, I was driving around the shopping district down by the port and saw fudge advertised. Well, I ask you, what could I do? I stopped in at the Big Wheel and bought a piece of fudge and some Christmas gifts. 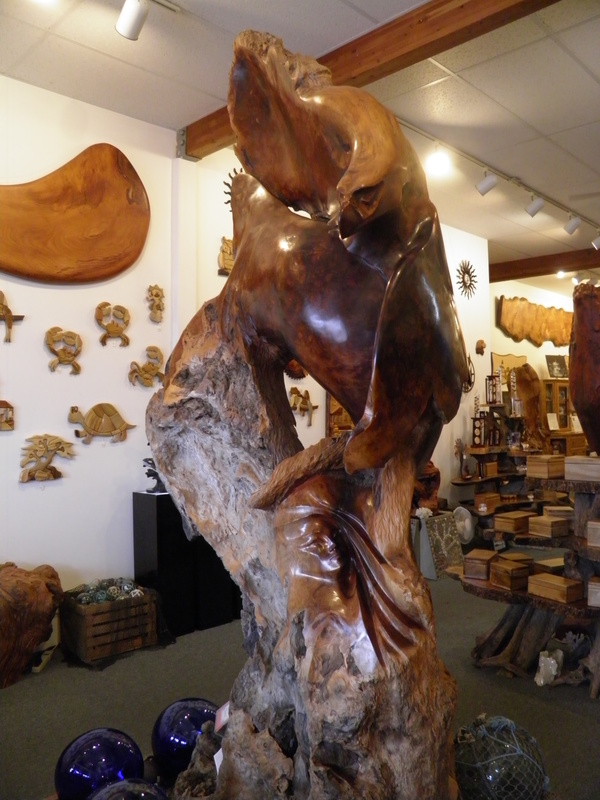 The clerk who helped me, Gayla, took me into the driftwood museum attached to the store. 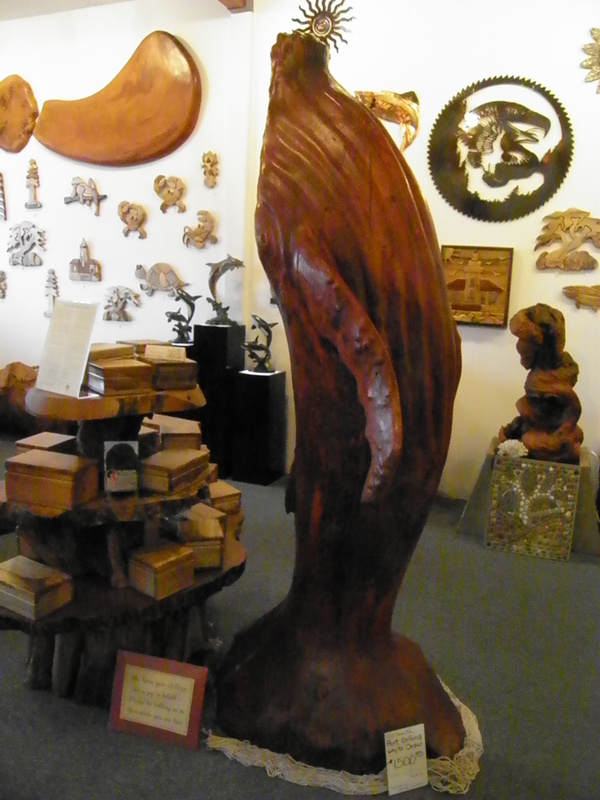 All the art in the museum is made/carved from driftwood. There are some wonderful pieces in there. Thanks to Gayla for telling me about them. And there are some really imaginative interpretations of Face Rock, Howling Dog, and Cat and Kittens rocks by a painter named Jill Stockford. I didn’t feel right about taking pictures of her paintings, but if you’re ever in Bandon, stop in to the Big Wheel, go into the driftwood museum, and take a look at them. They’re quite enjoyable. And buy a piece of fudge. It’s killer. 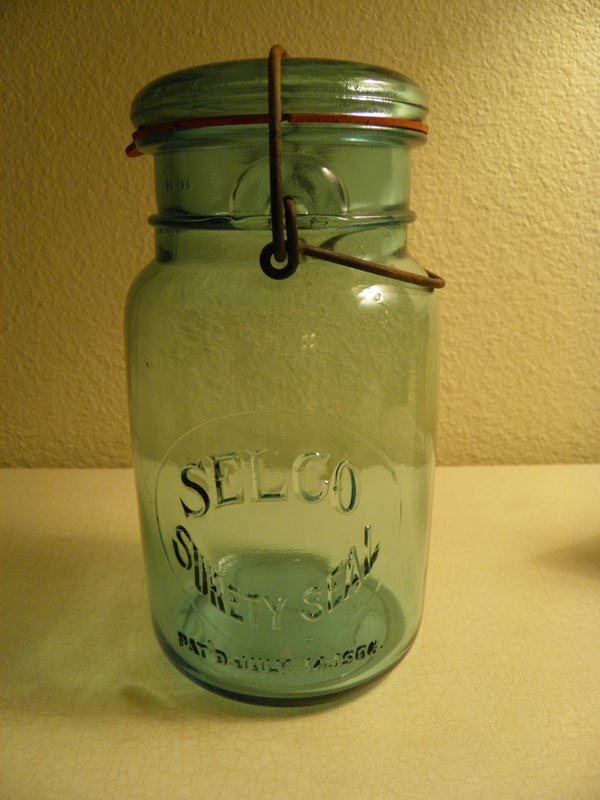 After that, I walked around the corner to an antique store, Neat Old Stuff, where I got something for myself. I rarely buy myself souvenirs. I rarely buy anyone souvenirs. But when I see something I’ve been hankering for for years at a great price, I’ll buy it for myself. This was my present to myself for this trip. I enjoyed my conversation with Eric, proprietor of Neat Old Stuff and part owner of Black Dragon Antiques. He really does have some neat old stuff in his small shop. I also bought some books at the used bookstore right next door. This is a terrific used bookstore, and I can’t remember the name of it, nor did I take a picture to remind myself. But if you’re into bookstores, this one in the port shopping area is well worth your time. After that, I thought I’d look around the main part of town a bit, and as I drove up the street, I spied Face Rock Creamery. Tara had told me about it. She said the cheese was fantastic and the ice cream portions were huge. Well, I had to stop. And while I was there, eating mocha with chocolate chunk ice cream, I had a delightful conversation with a local couple also eating ice cream. I never learned his name, but her name is Sue. She told me how she prepares long-neck clams, and since I have some in the freezer to deal with, I’m going to try her baked method. Sue, thanks for that, and for giving me your email so I can check the details with you later on. Now, I have to buy some ramekins! At that point, the rain was coming down in serious fashion, and it was getting dusky. I decided it would be a good idea to come back to the hotel and get dried out, then go out for a light dinner, a salad maybe, since I had that big, fried seafood lunch. 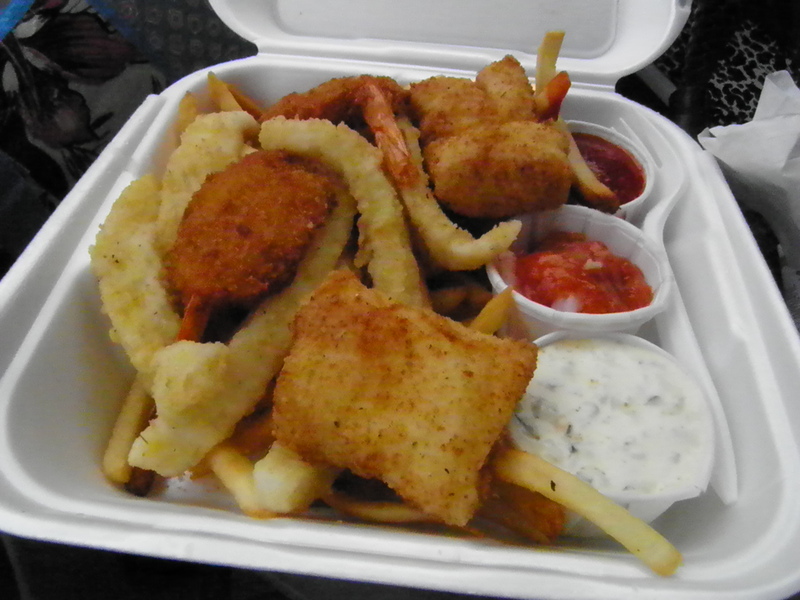 I ended up going down to Lord Bennett’s and ordering a Caesar salad with crab and shrimp and taking it back to my room in a box, where I’ve been stretched out on the bed, noshing and reading and listening to the ocean. And now, I’m going to drink some decaf coffee and eat some of that delicious fudge! Tomorrow, it’s on to Crescent City, and a big, family crab feed with my sister and brother and whatever other family members decide to show up. It can’t get better than that.